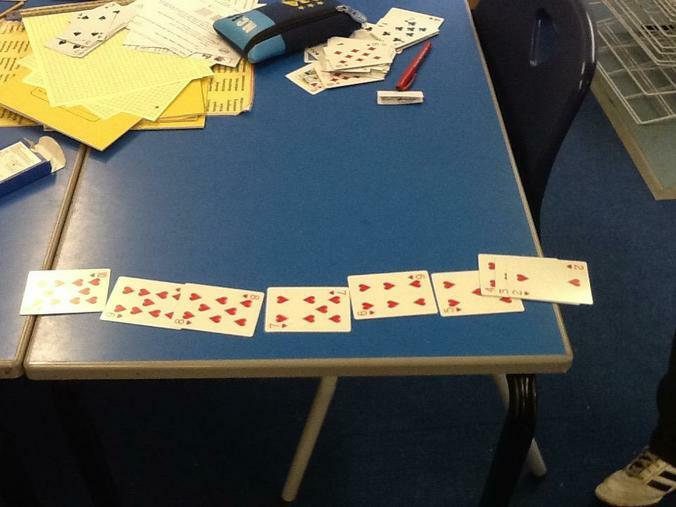 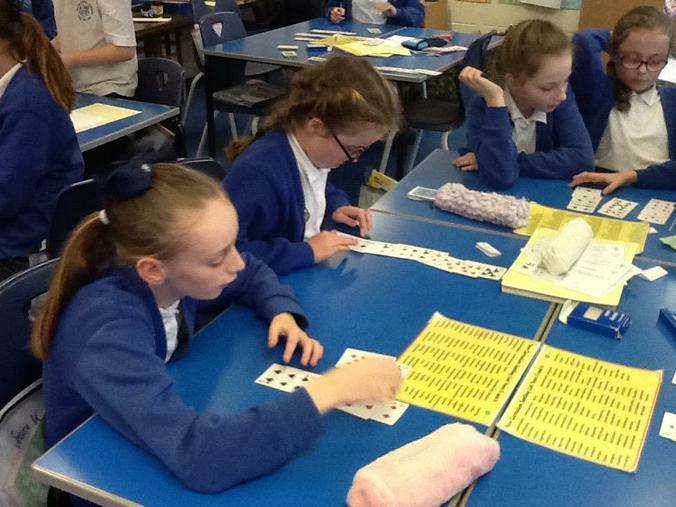 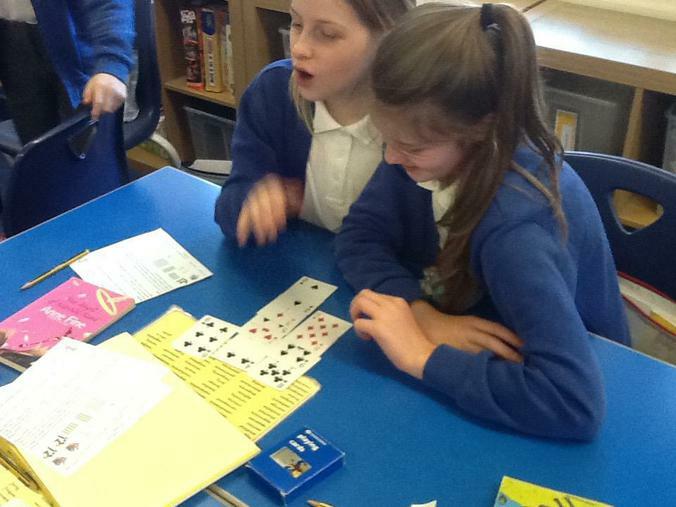 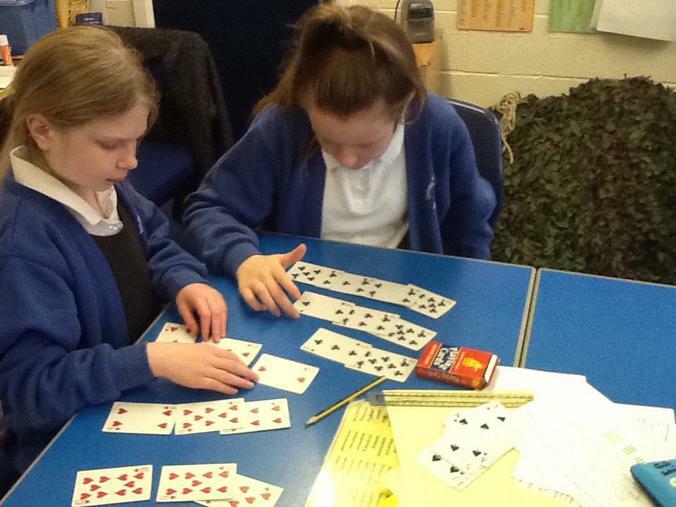 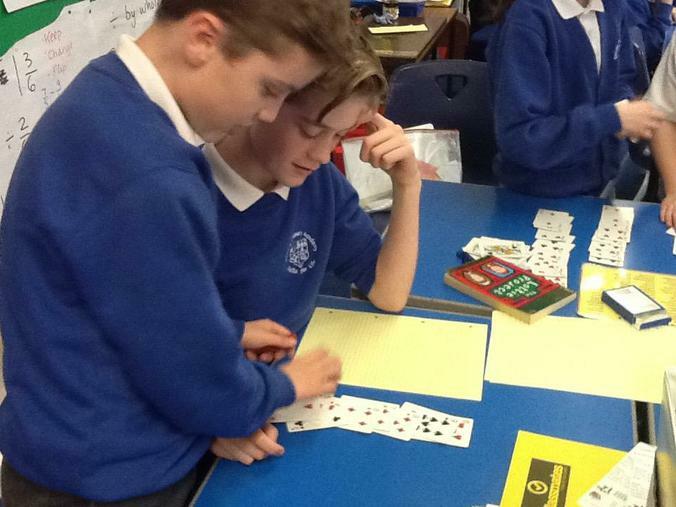 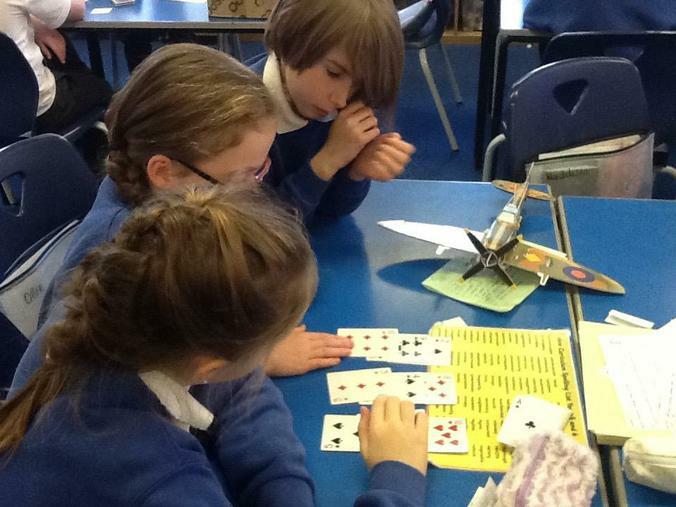 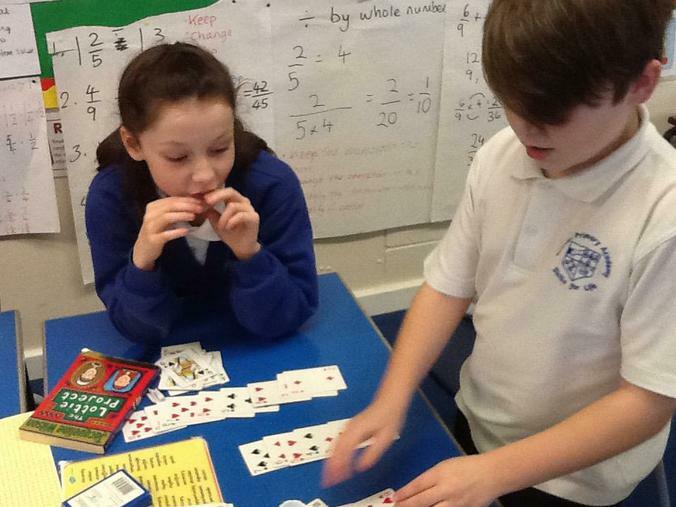 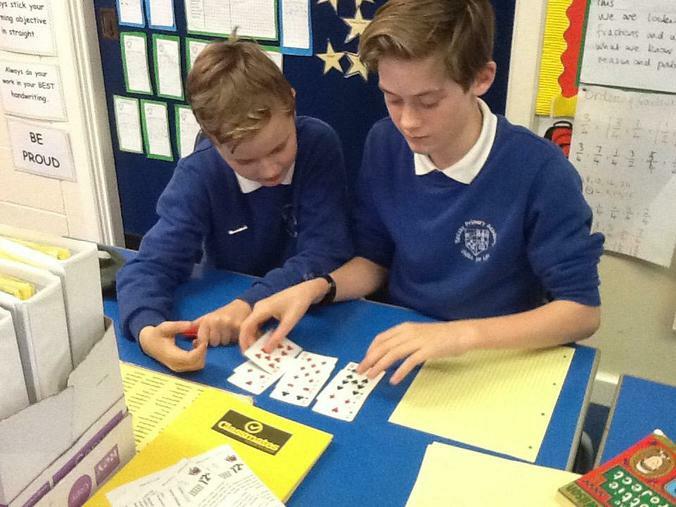 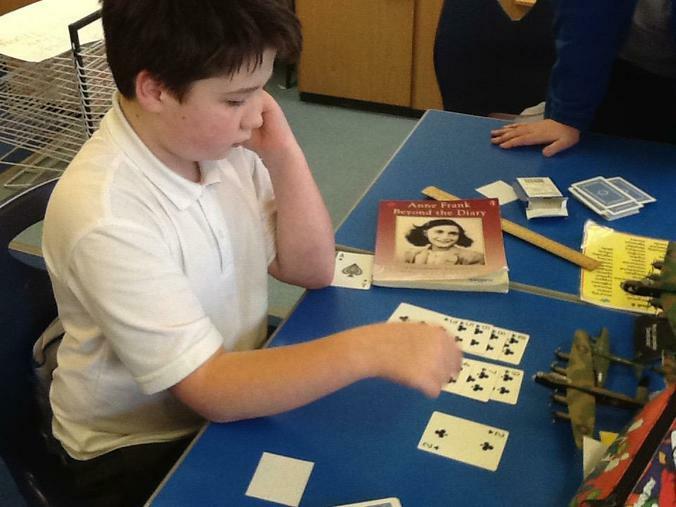 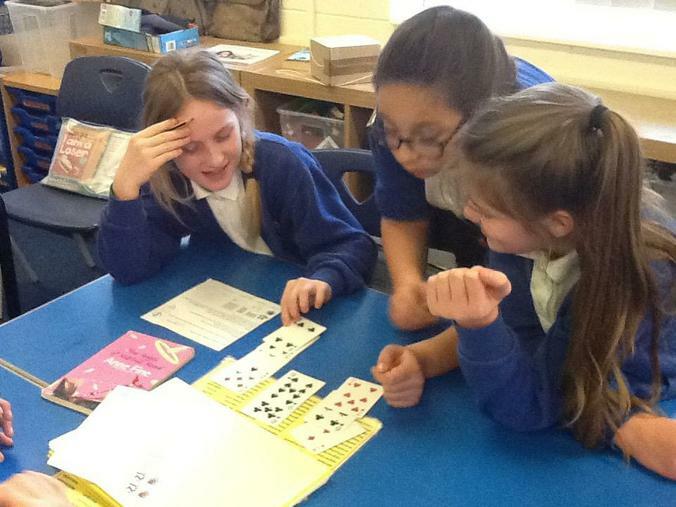 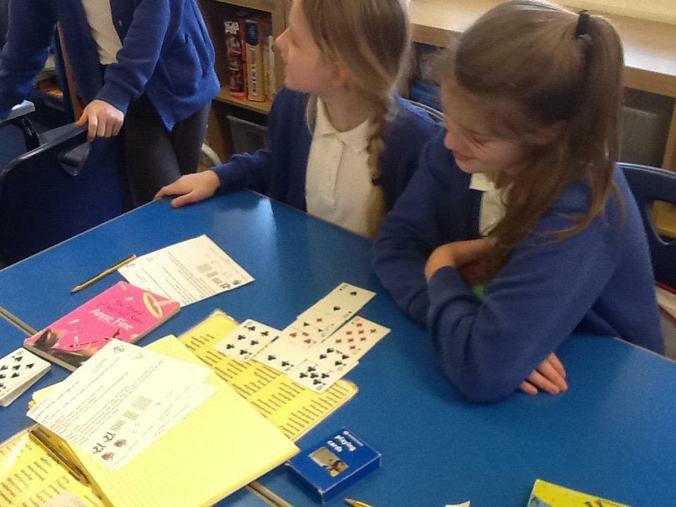 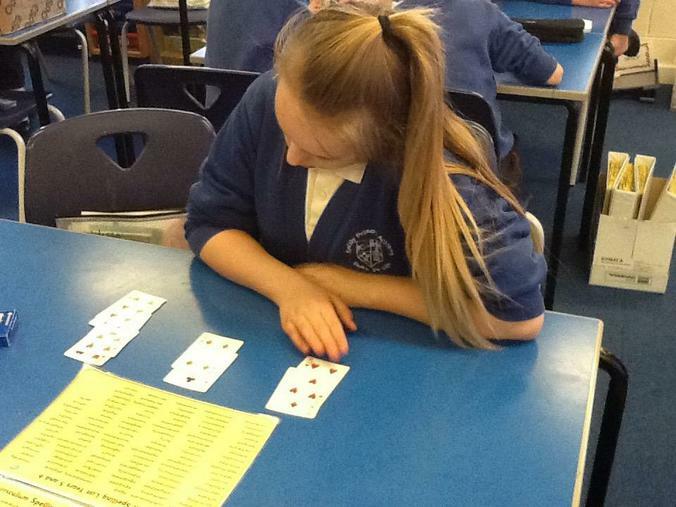 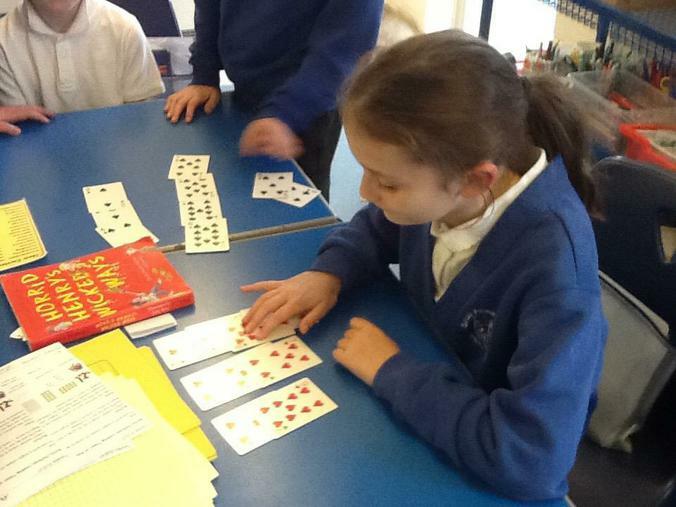 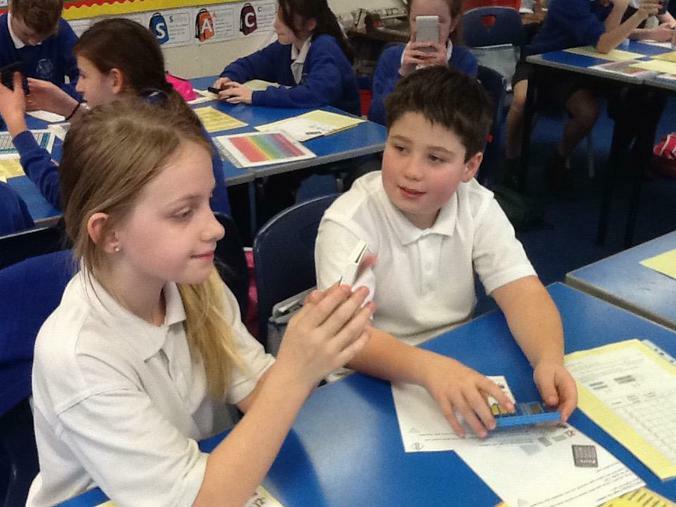 This week's math challenge involved using playing cards. 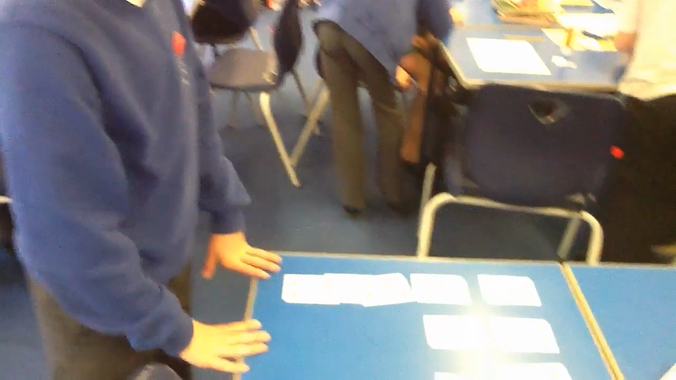 The aim of the challenge was to end up with all the cards in sequence from 10-2. 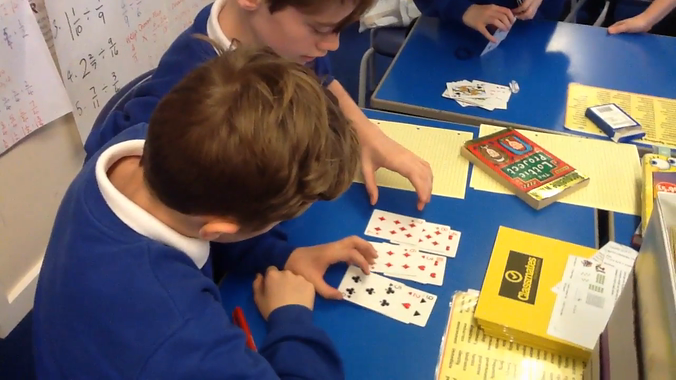 However the rules stated that cards had to start in three piles, only be moved to the bottom of each row if the value was lower and finally to only move one card at time. 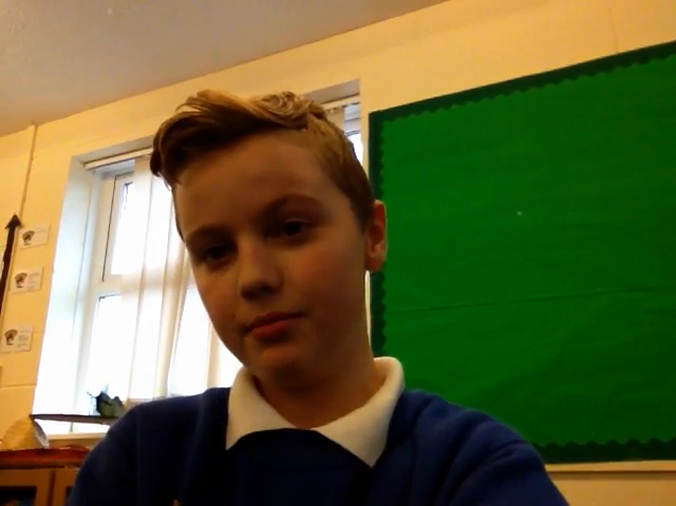 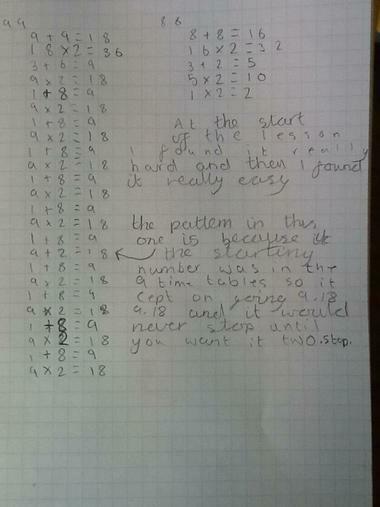 Here's how Year 6 did. 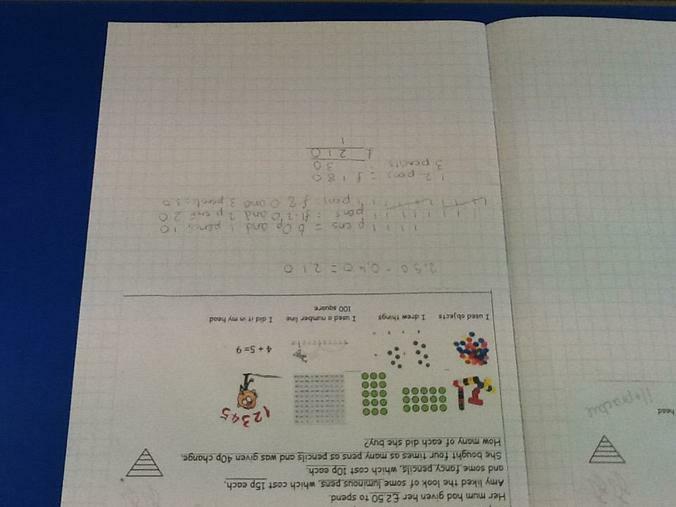 This week's challenge was to spot patterns in numbers when creating staircases with blocks. 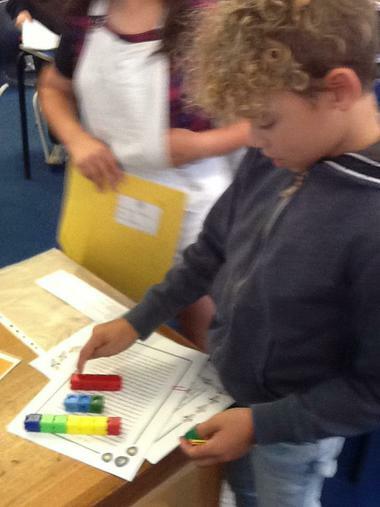 The children explored the staircases they made, counting the blocks used, then added the next step up. 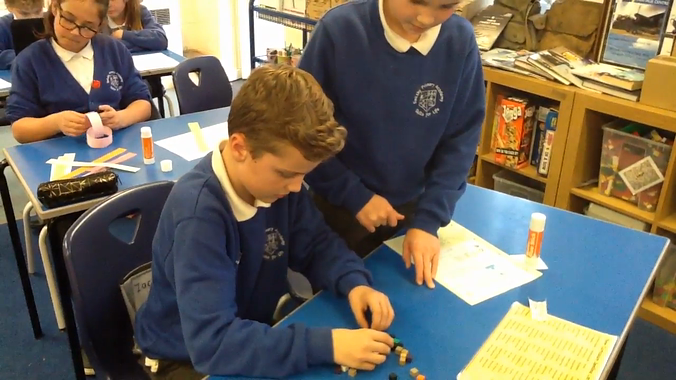 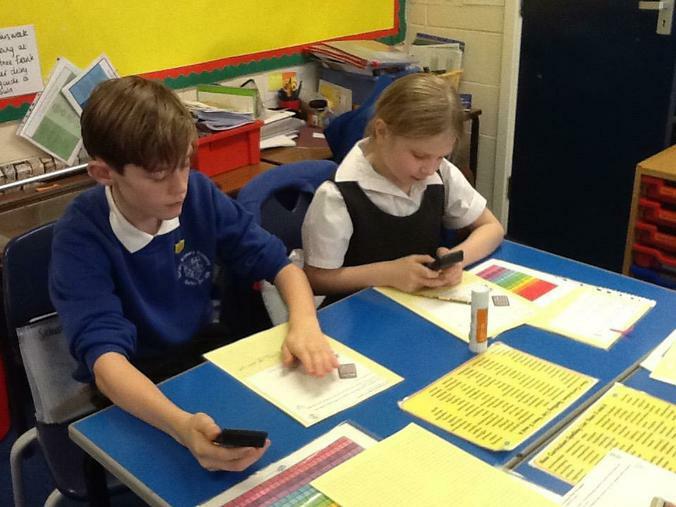 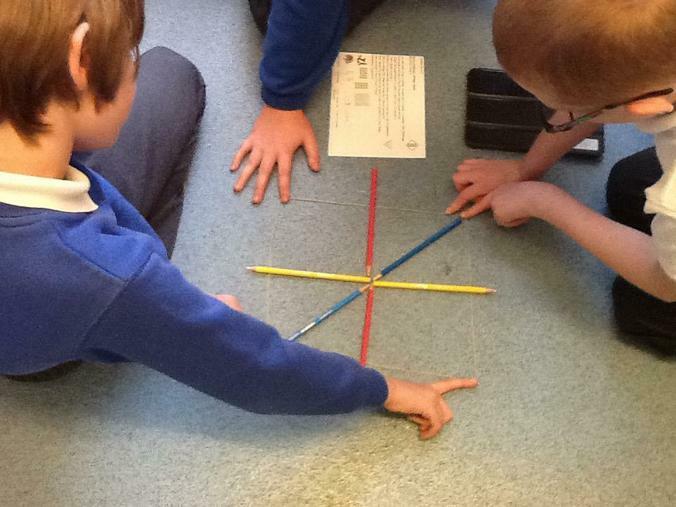 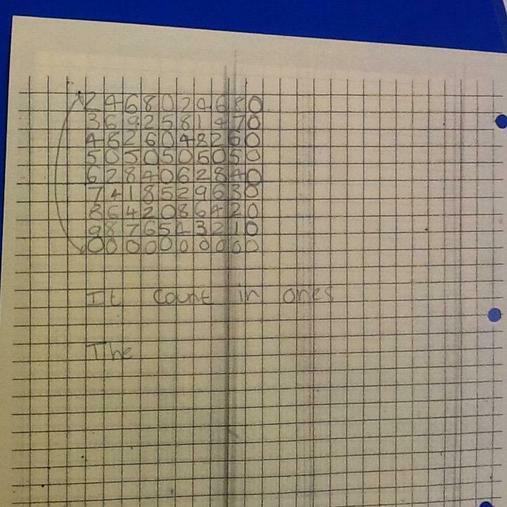 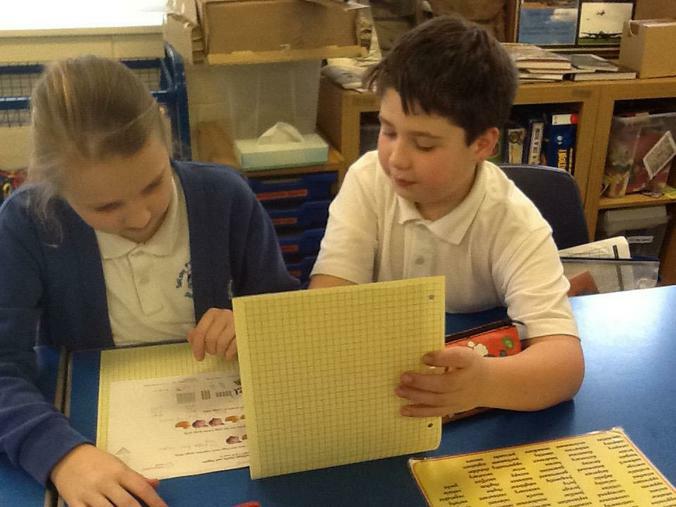 They had to investigate whether the number of blocks created a pattern and if so could they predict the next quantity needed without having to make the next staircase. 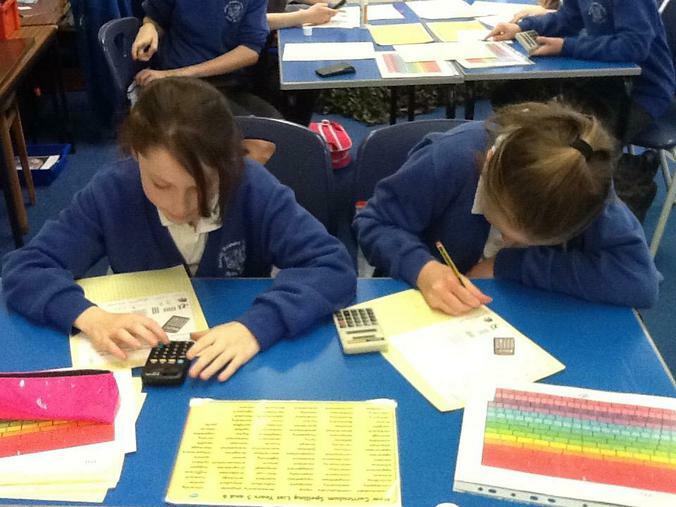 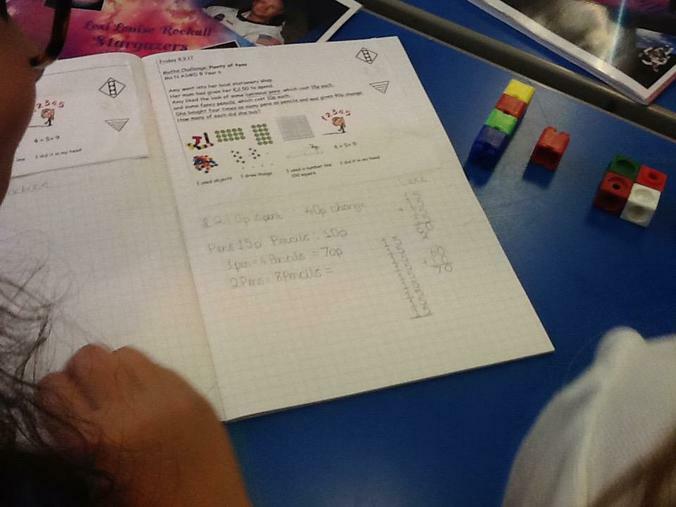 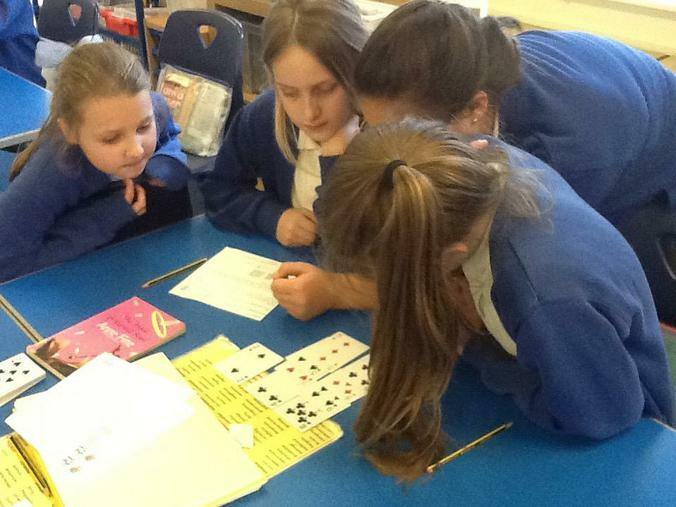 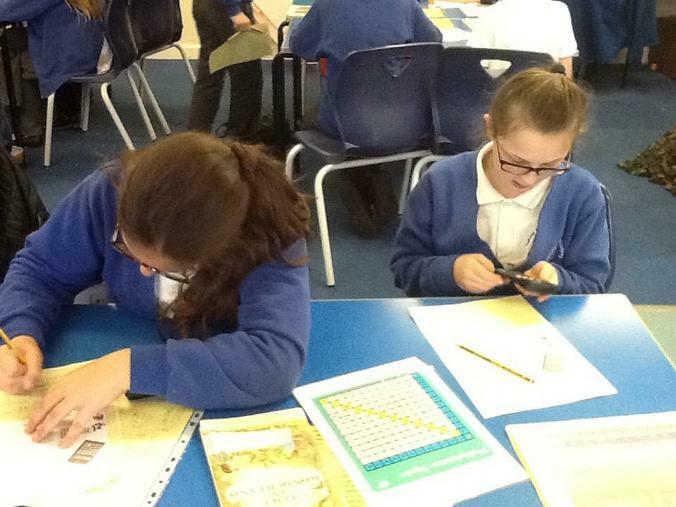 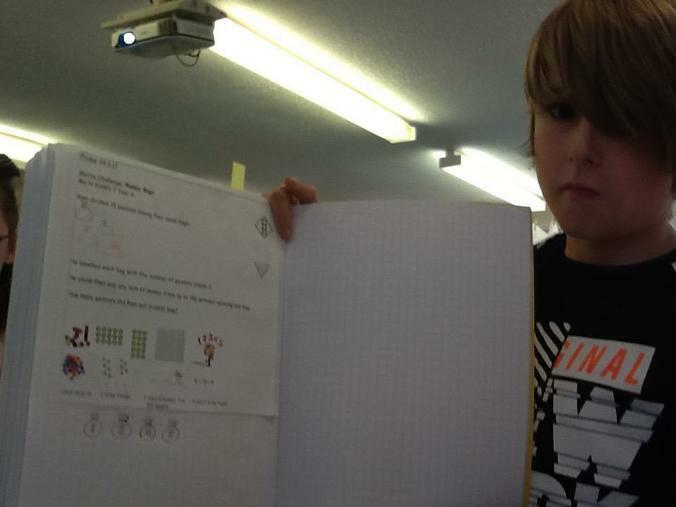 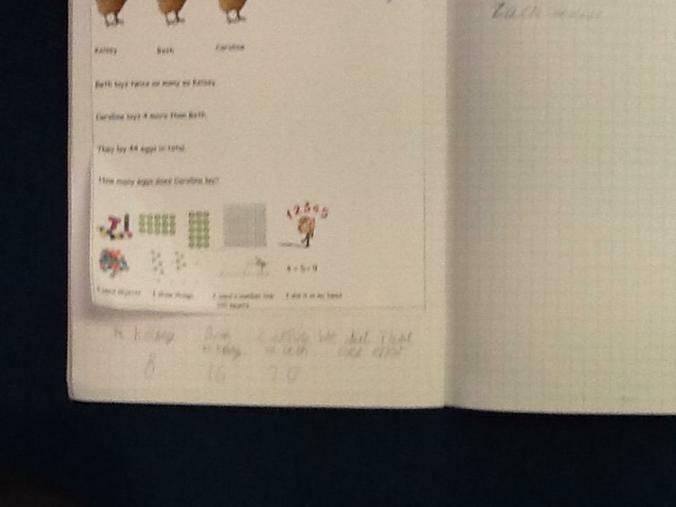 Collaboration and visualising were the key to this week's math challenge. 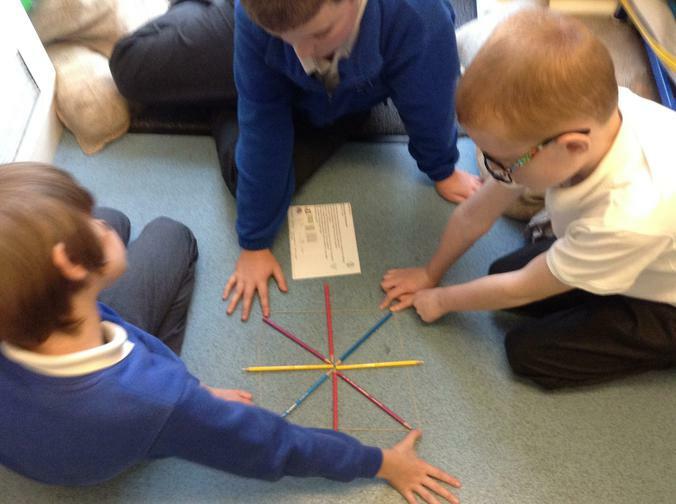 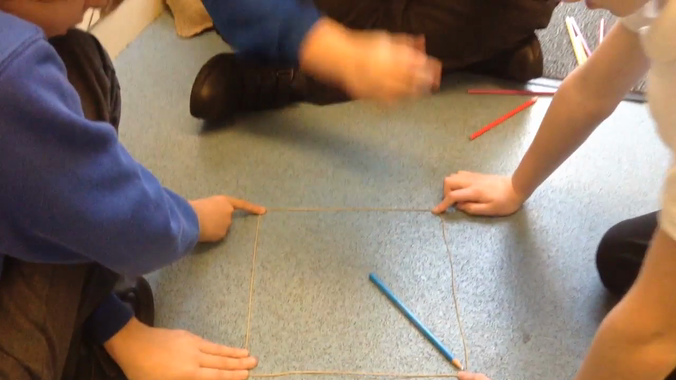 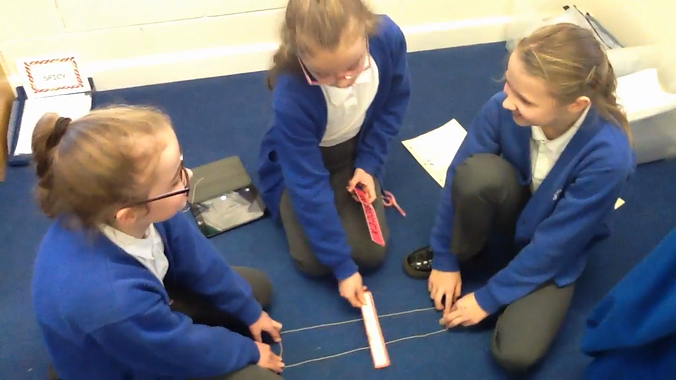 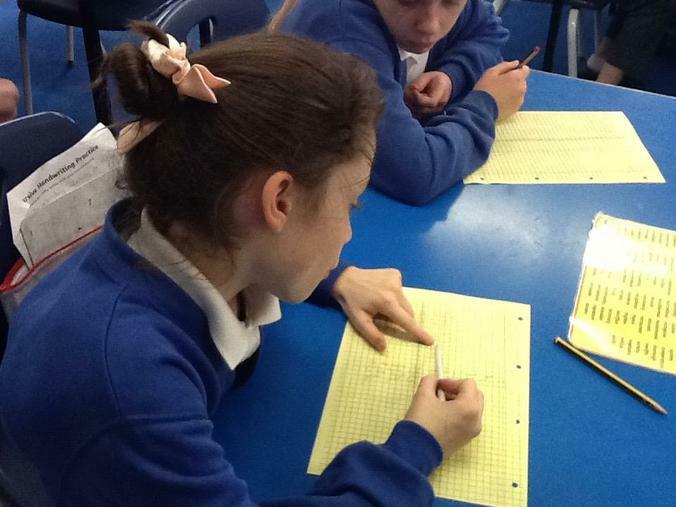 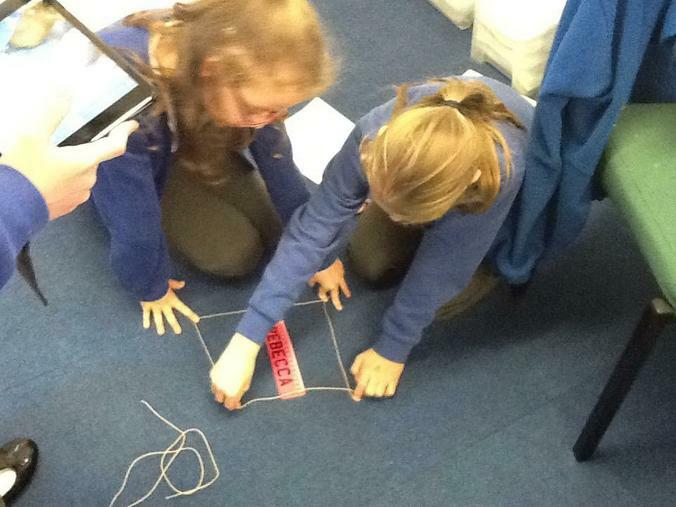 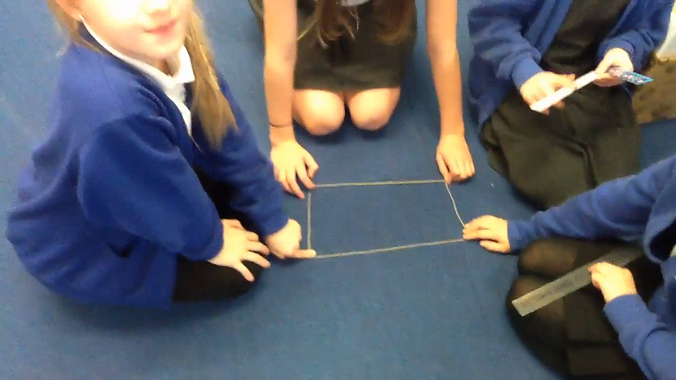 Each group had to create a quadrilateral using string then find lines of symmetry within the shape. 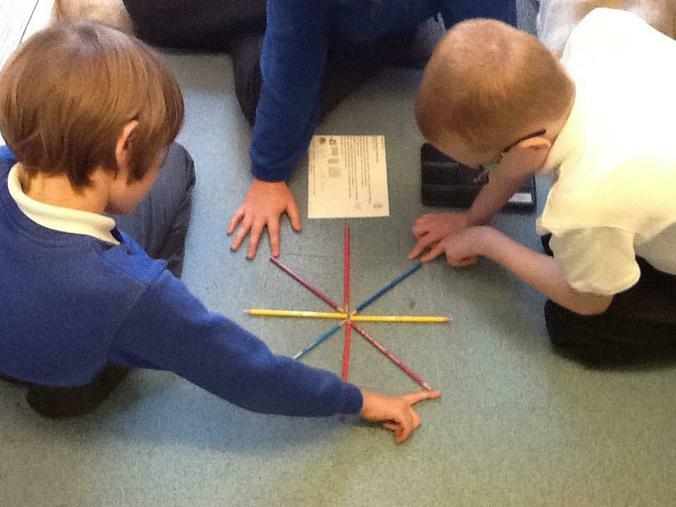 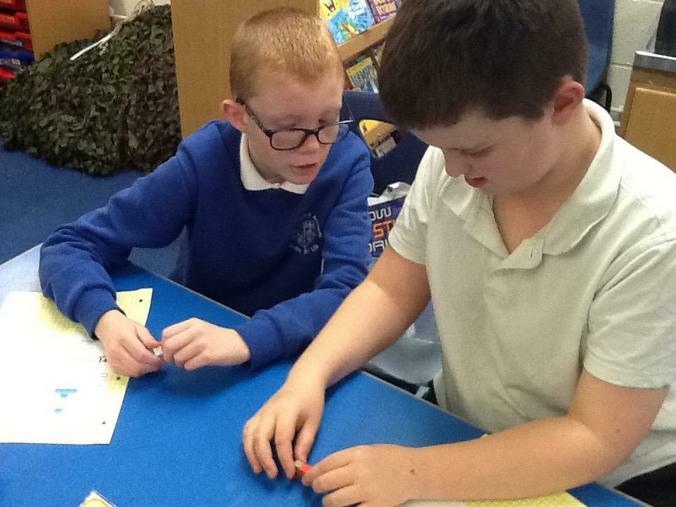 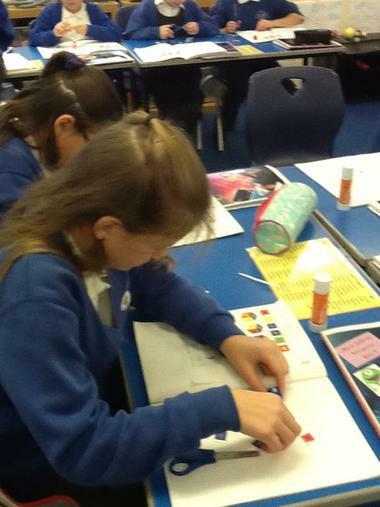 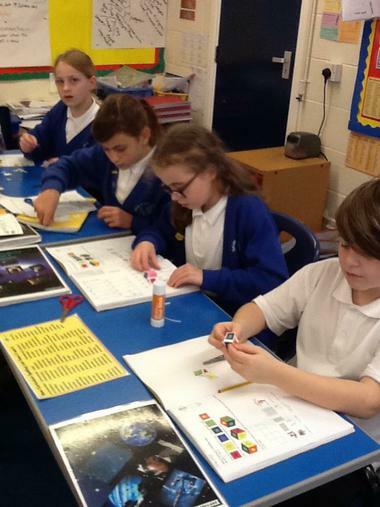 This week's challenge required the children to use what they knew about fractions and square numbers to try and solve how many discs (of a certain colour) could be fitted into the box. 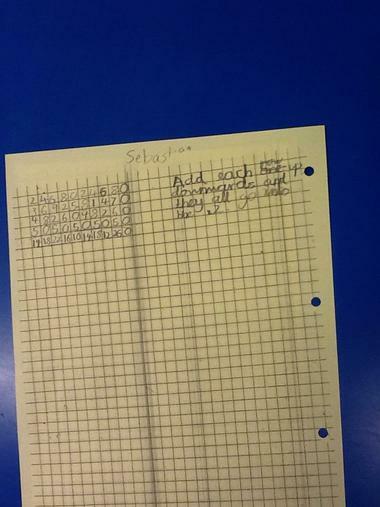 Information was given but amounts were not. 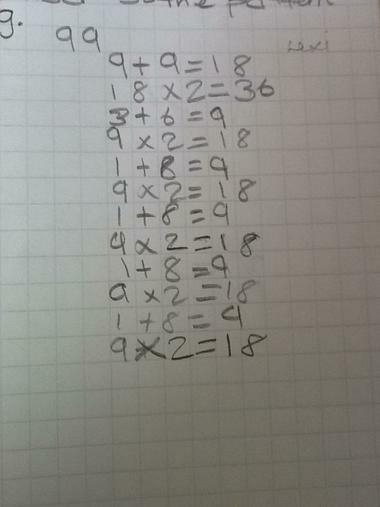 Here are our solutions. 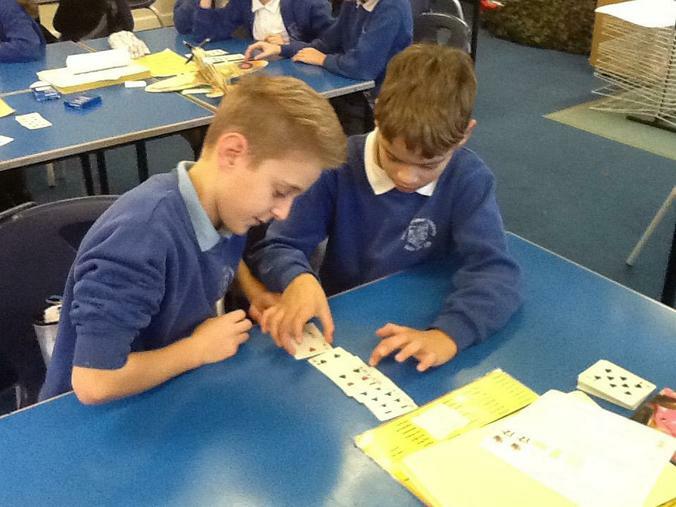 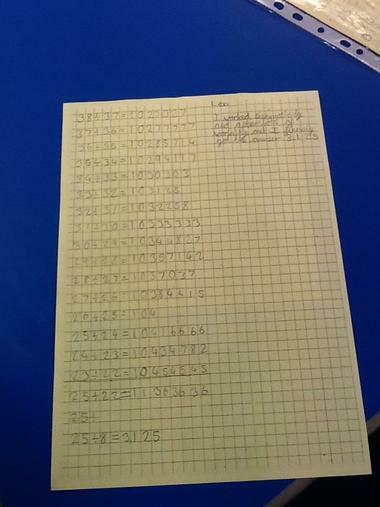 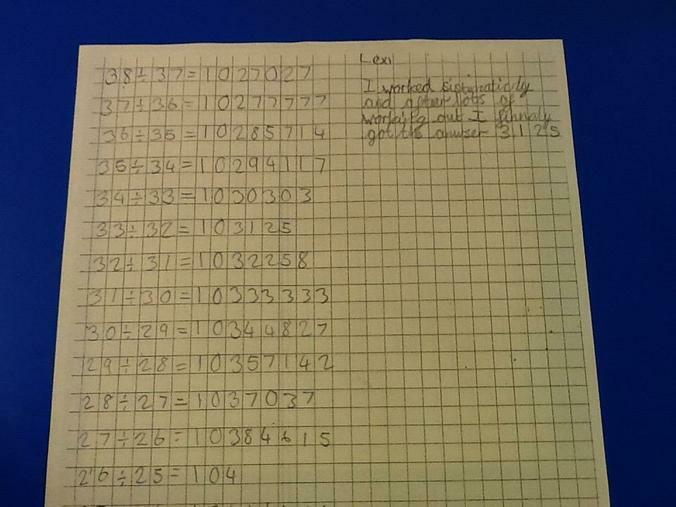 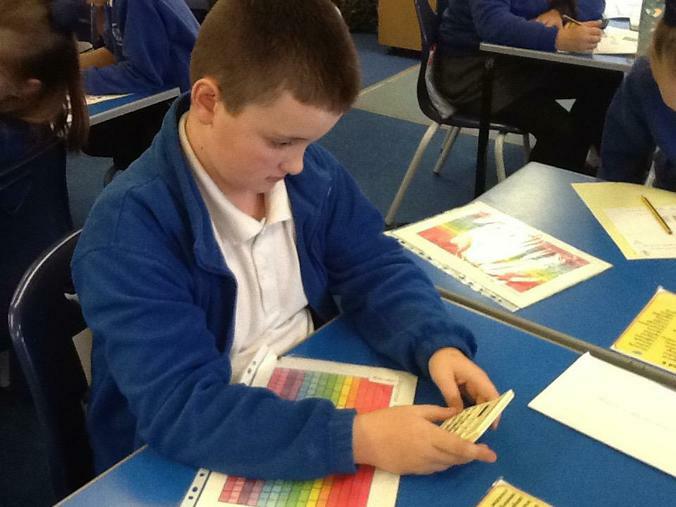 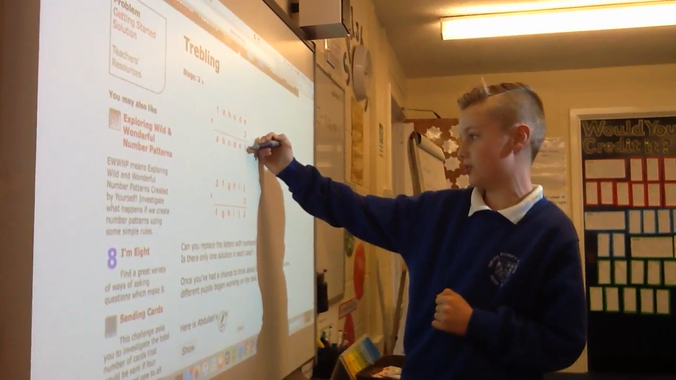 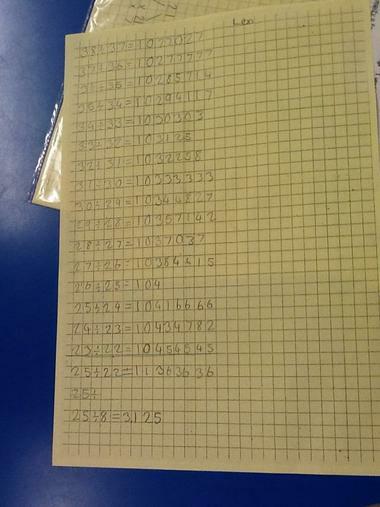 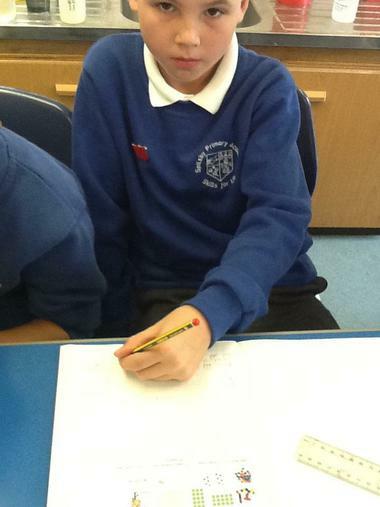 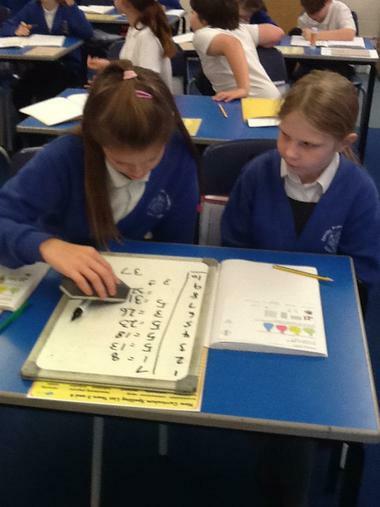 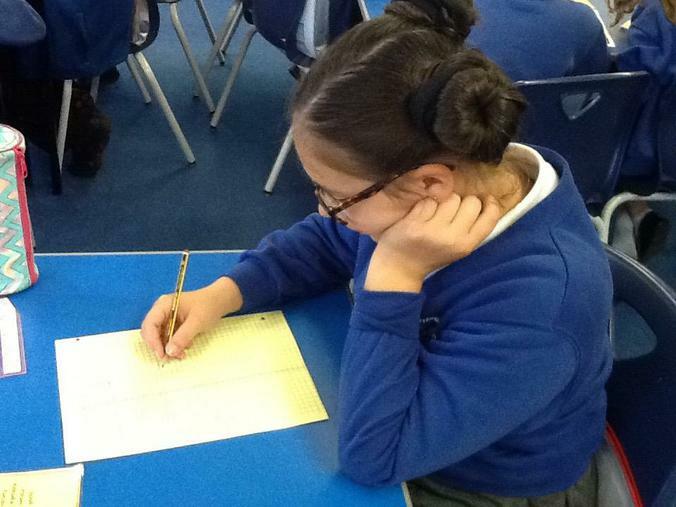 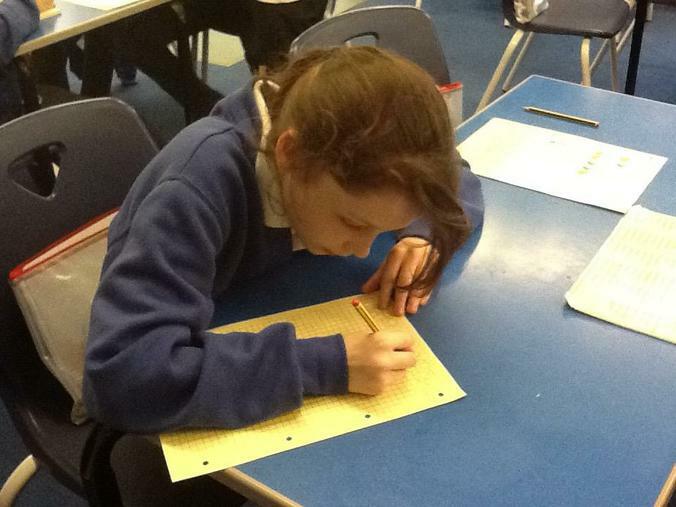 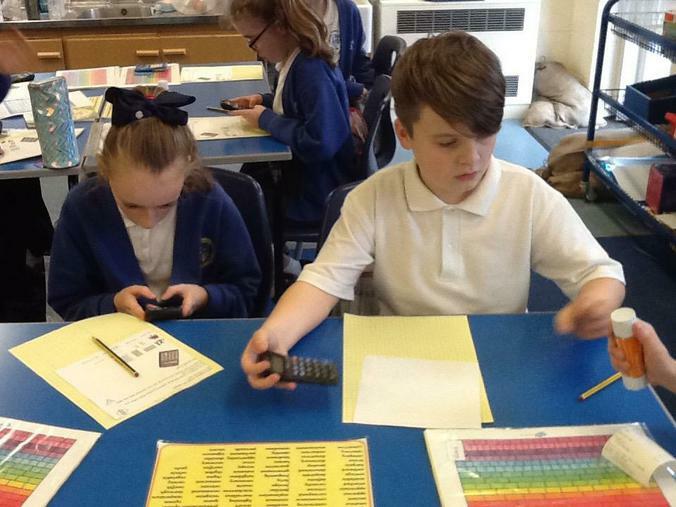 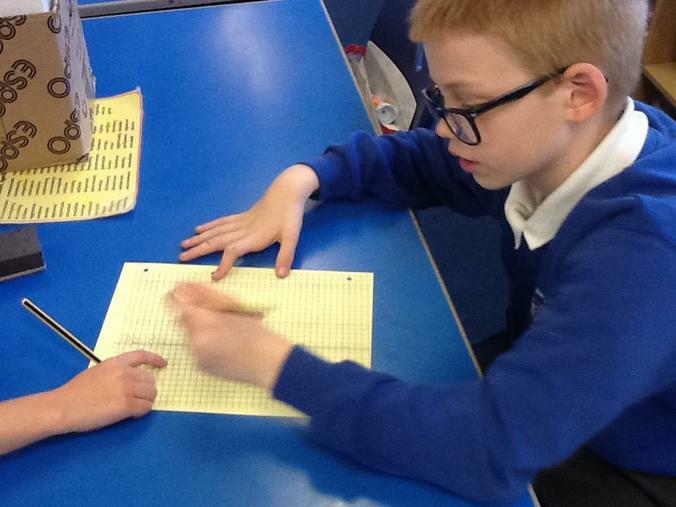 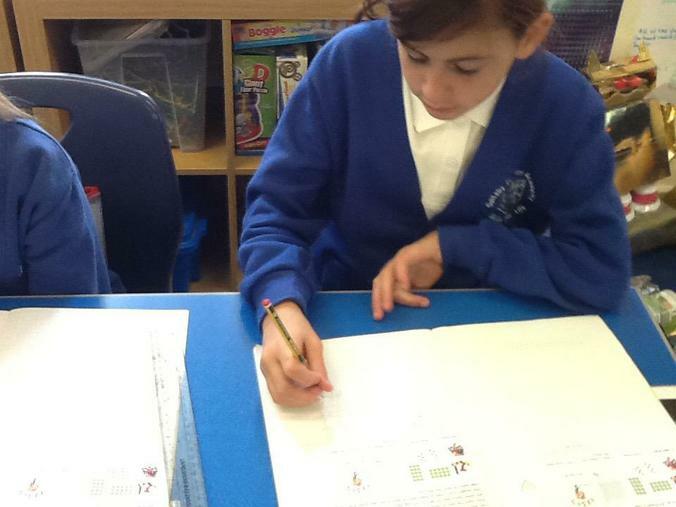 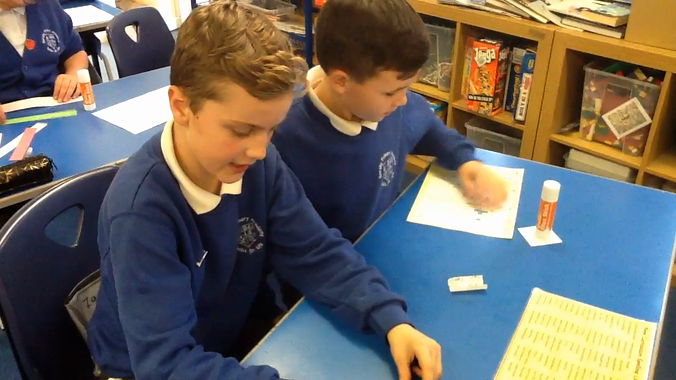 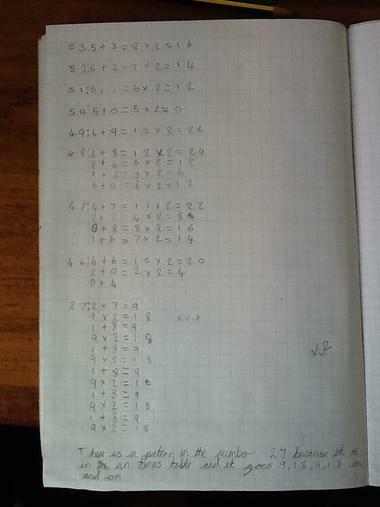 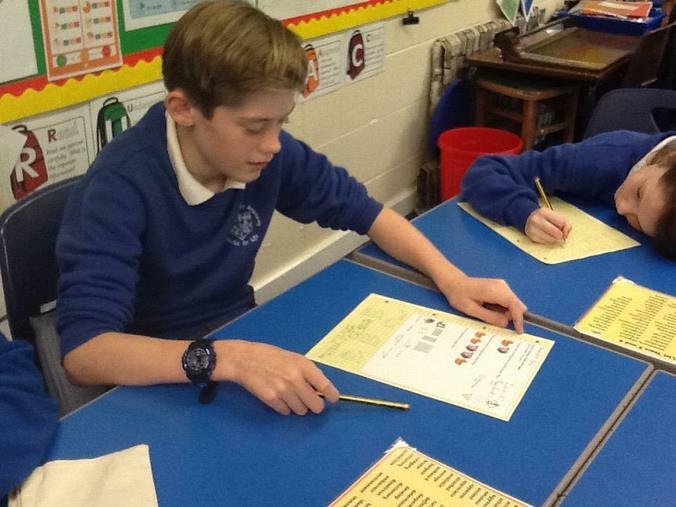 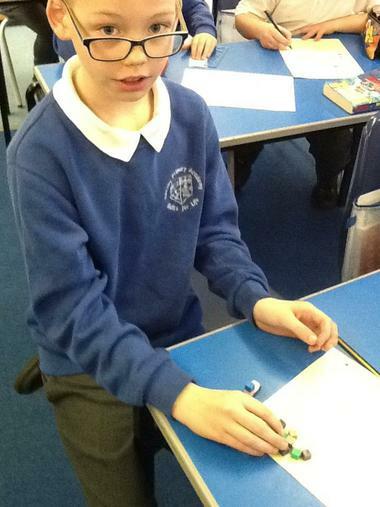 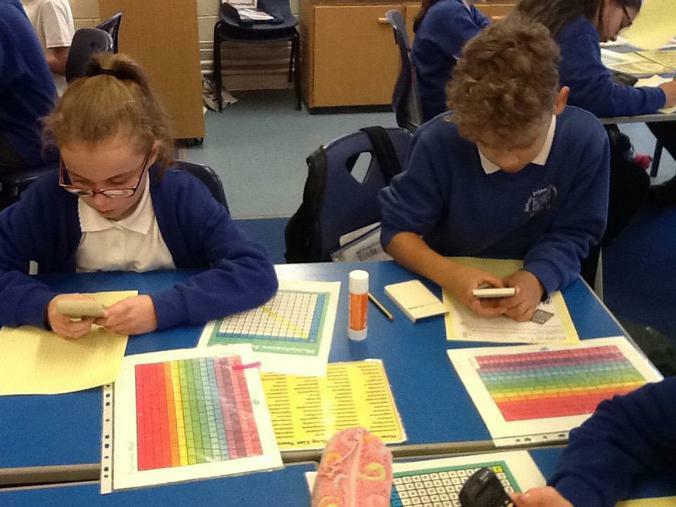 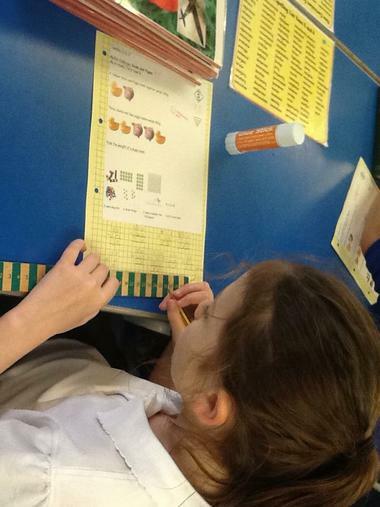 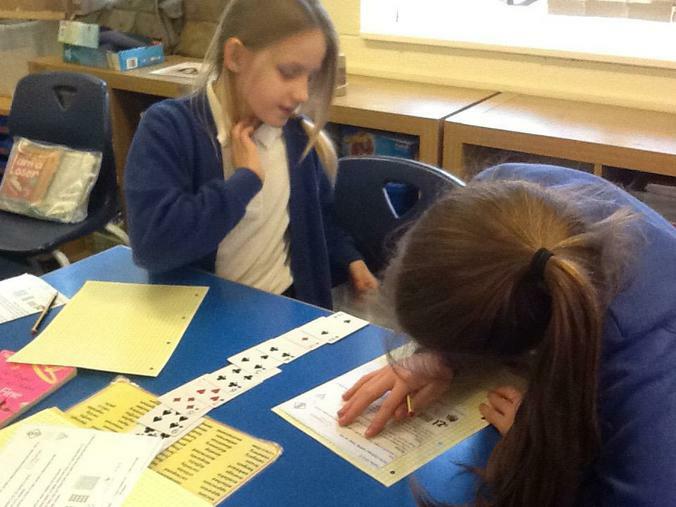 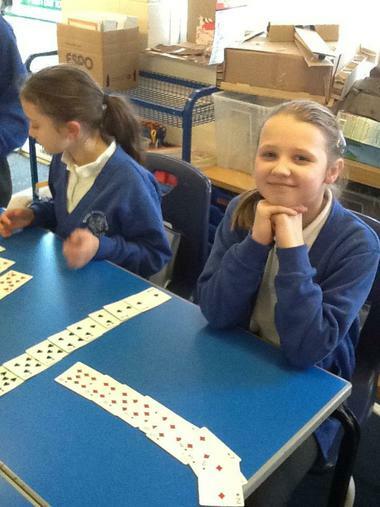 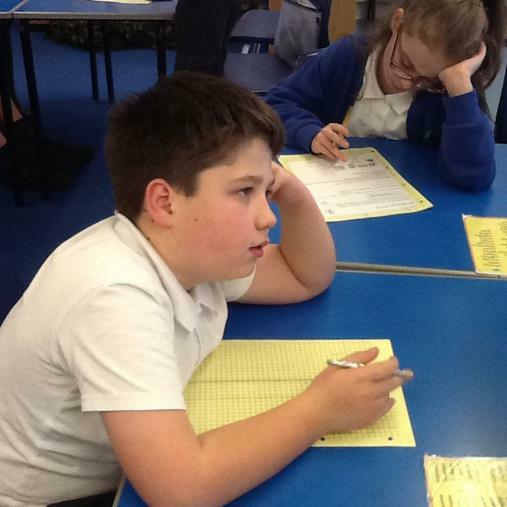 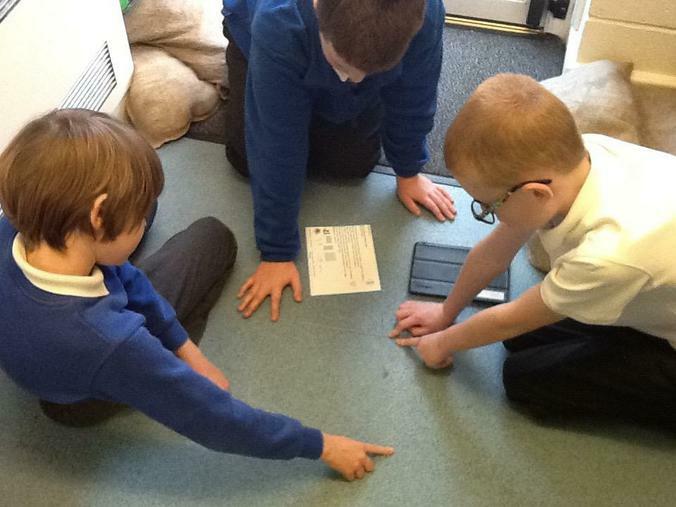 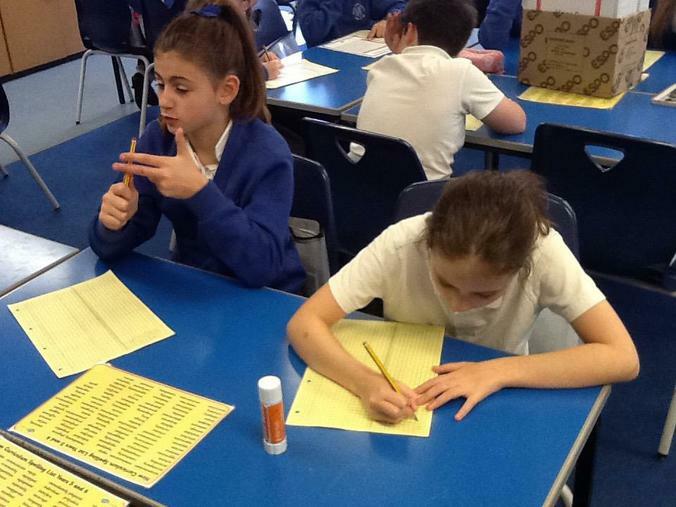 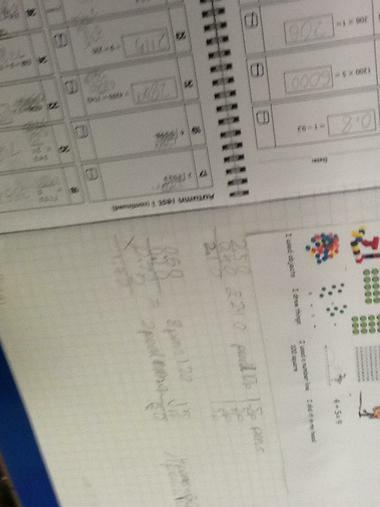 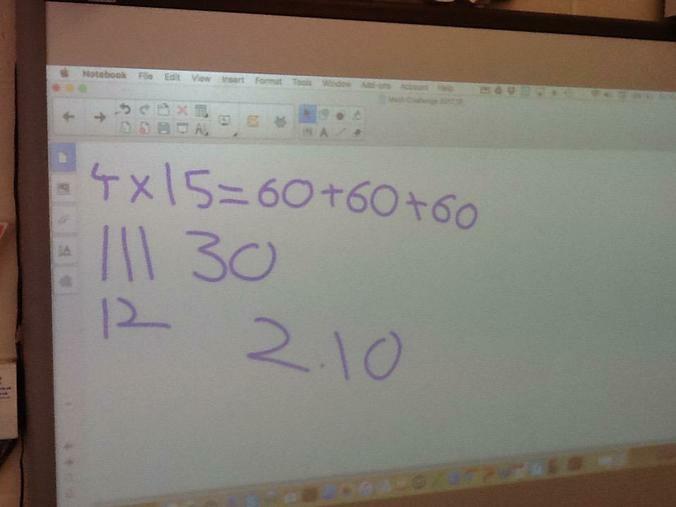 The children had a trial and error system of using exactly 10 numbers from the list 1,3,5 or 7 to make the total 37. 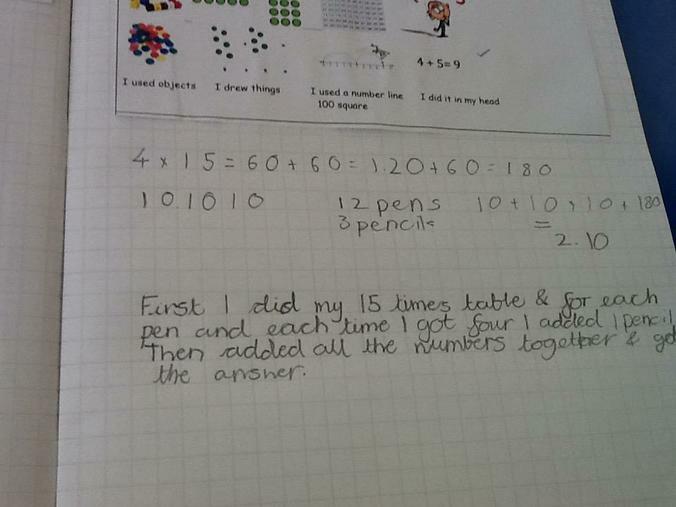 After many false claims of 'I've done it!' 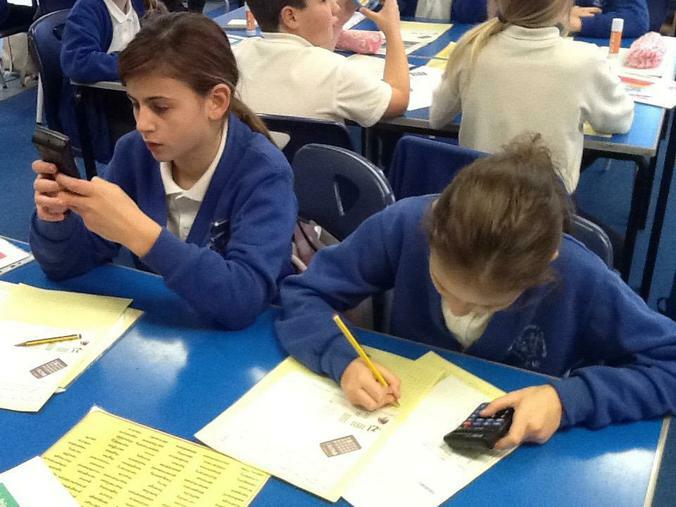 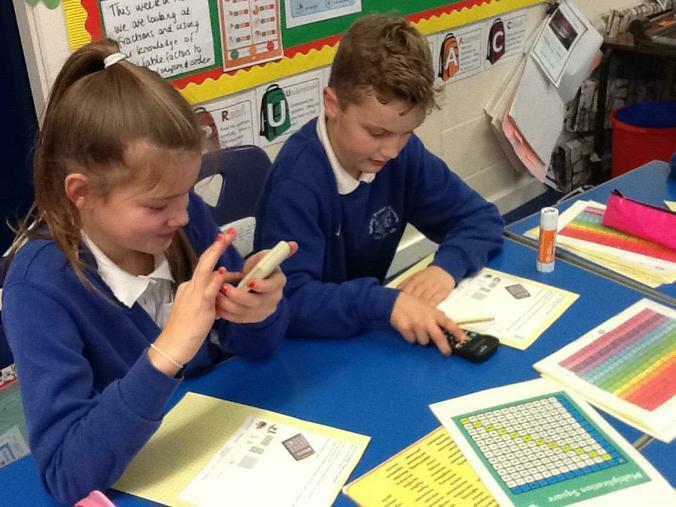 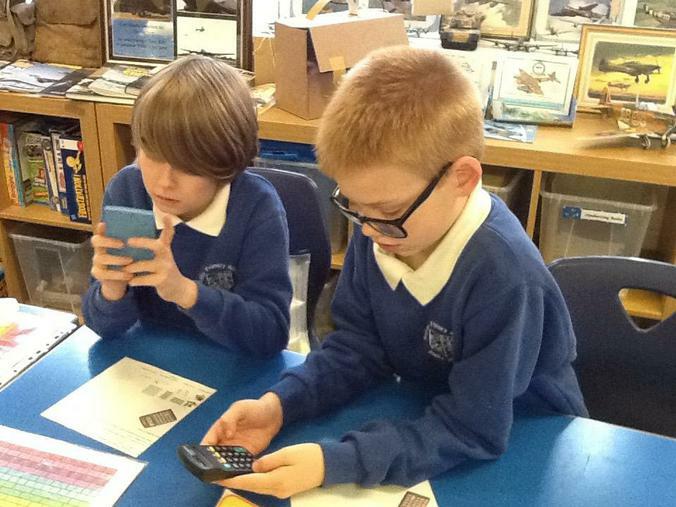 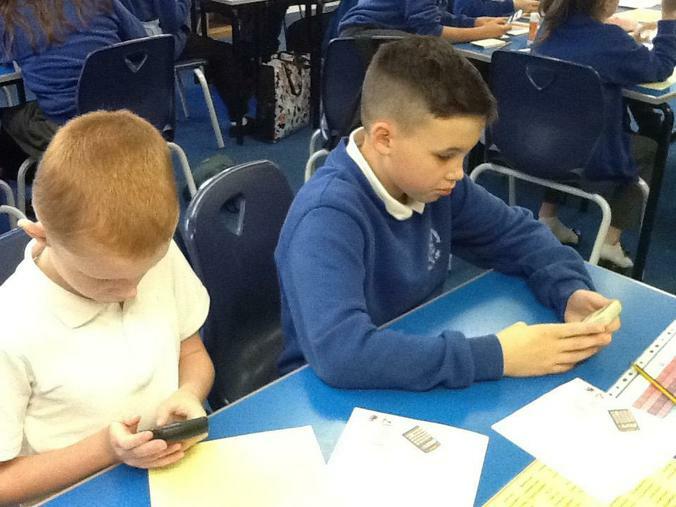 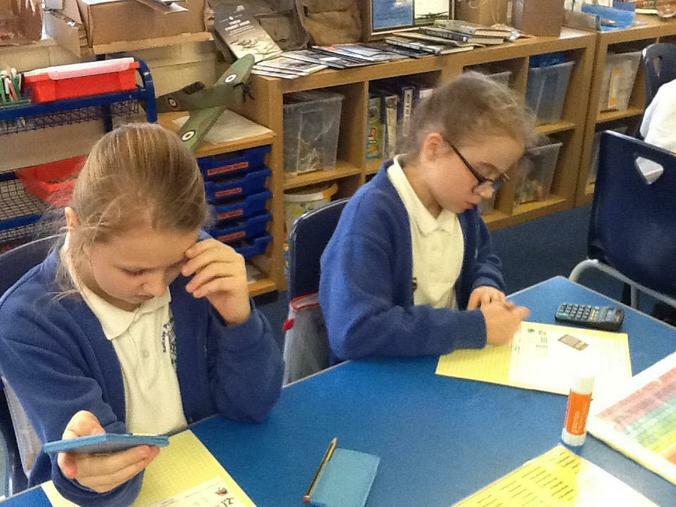 to be checked as 'your total is 38 or different , to you've used too many digits' we had a look online to see the solution. 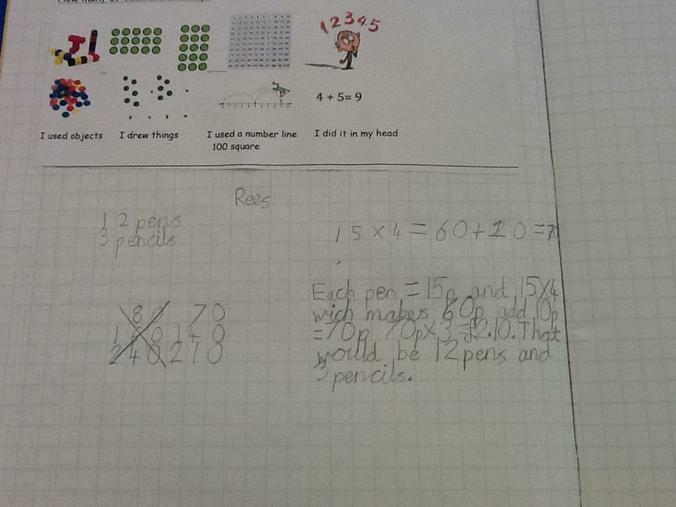 Here are our explanations of our workings out. 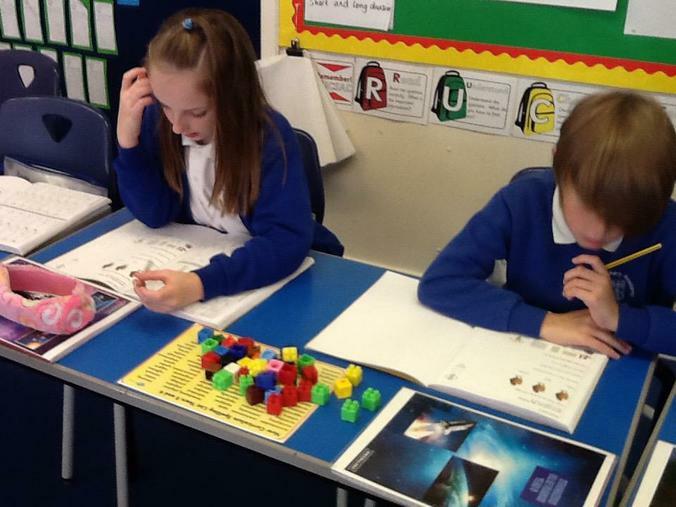 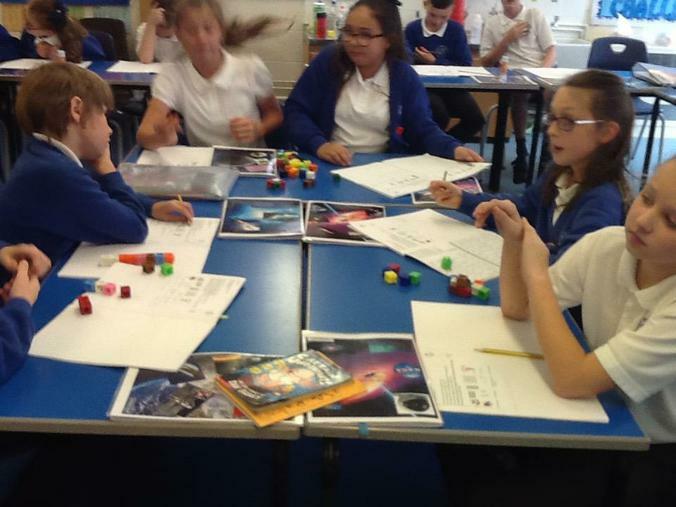 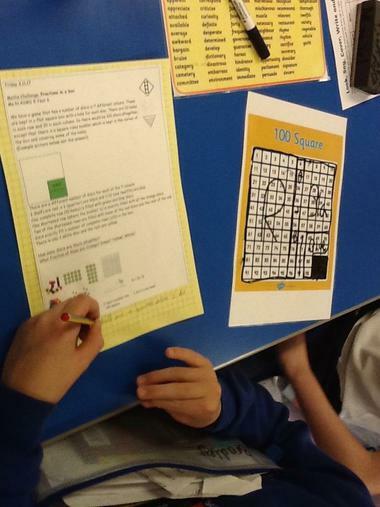 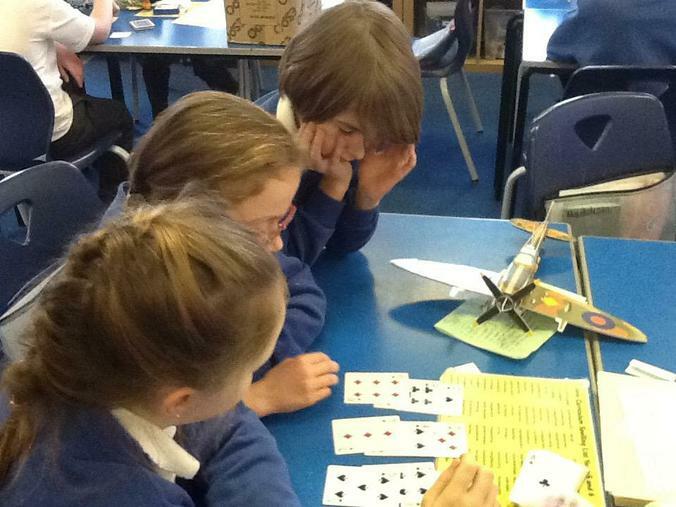 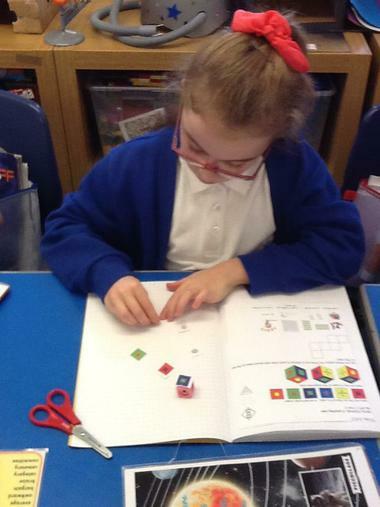 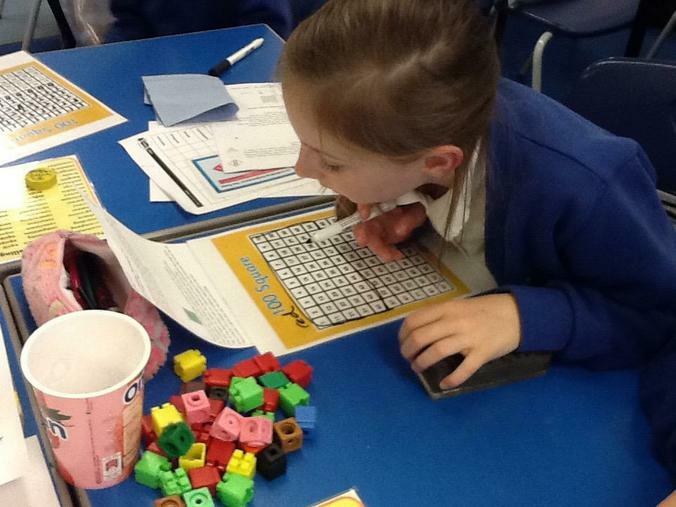 For this week's challenge the children had to work out the net of a cube with only certain views of its faces. 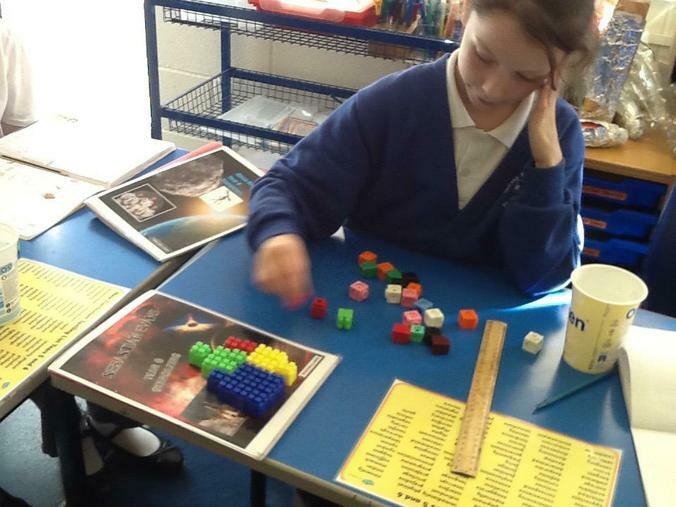 Some children chose a hands on approach of sticking the faces on a cube and testing the positions. 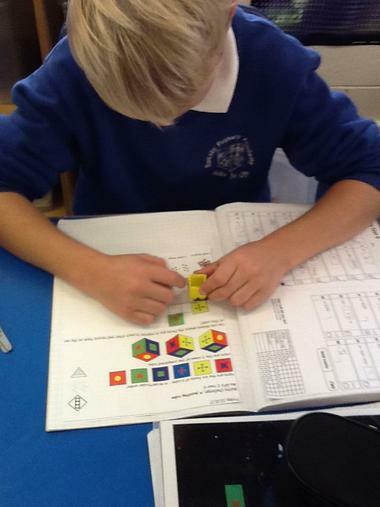 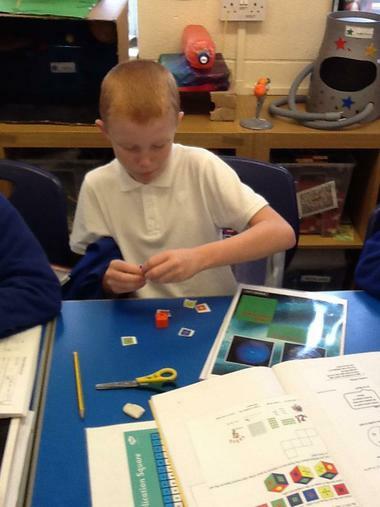 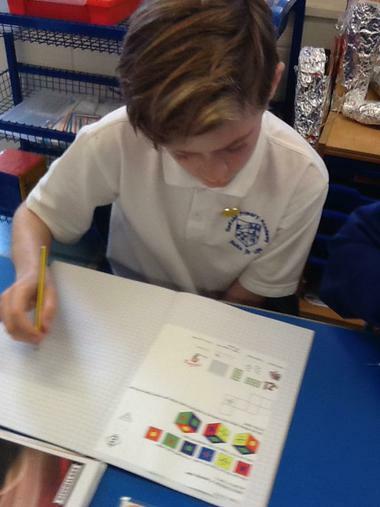 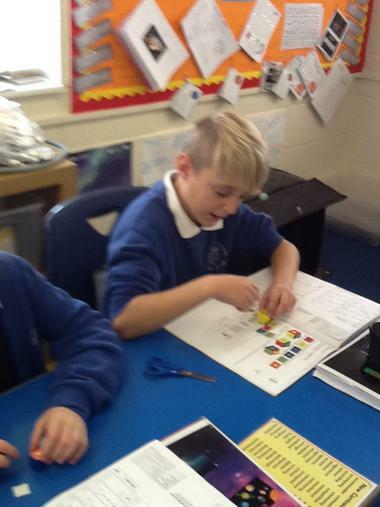 While other children were visualising the cube being folded and unfolded, as well as turning it to check the patterns matched the criteria. 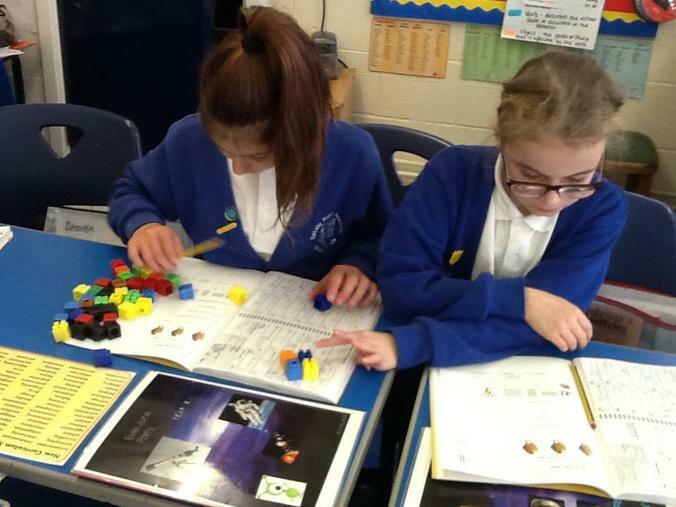 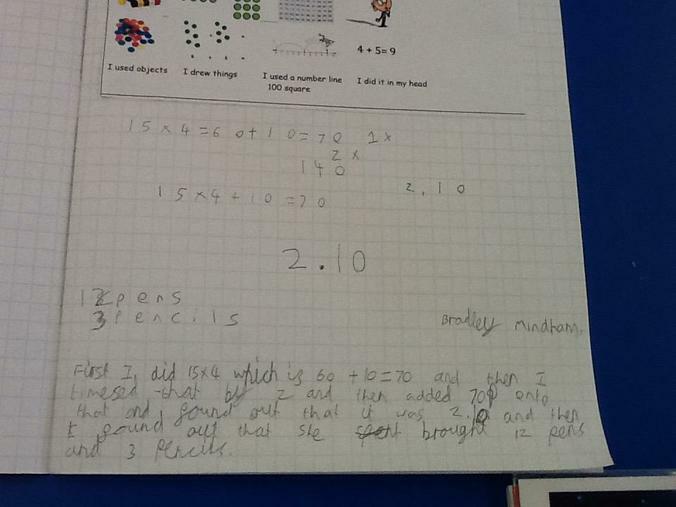 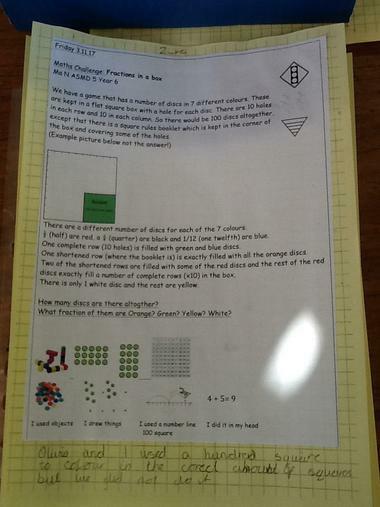 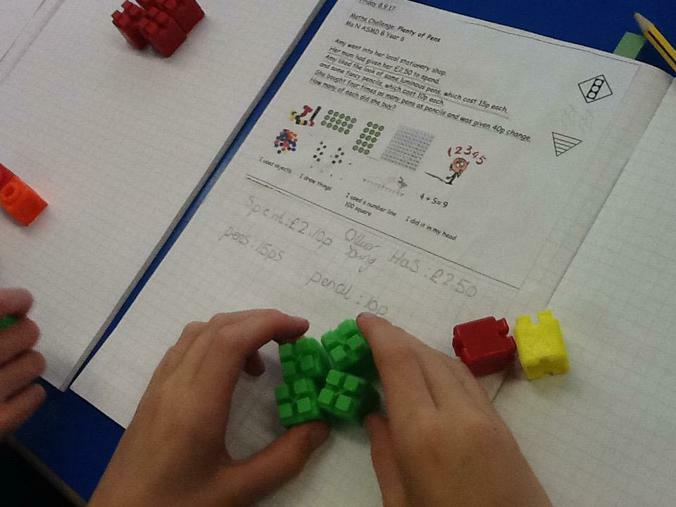 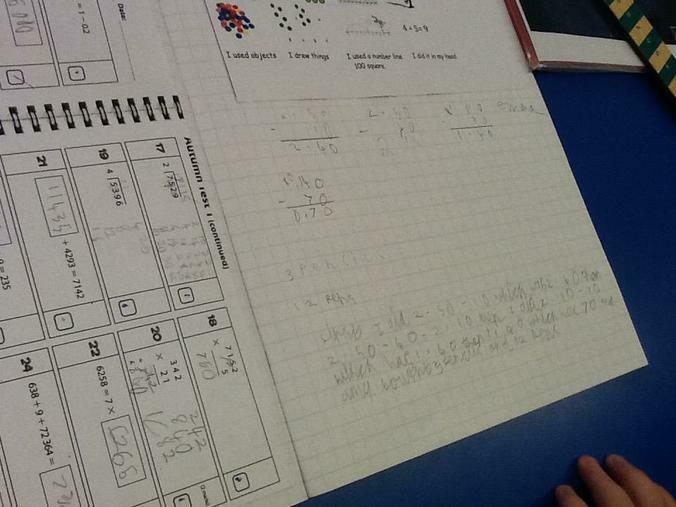 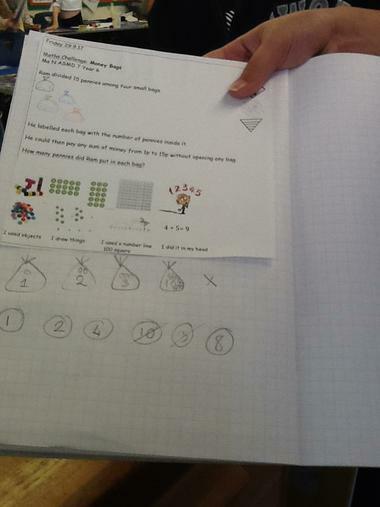 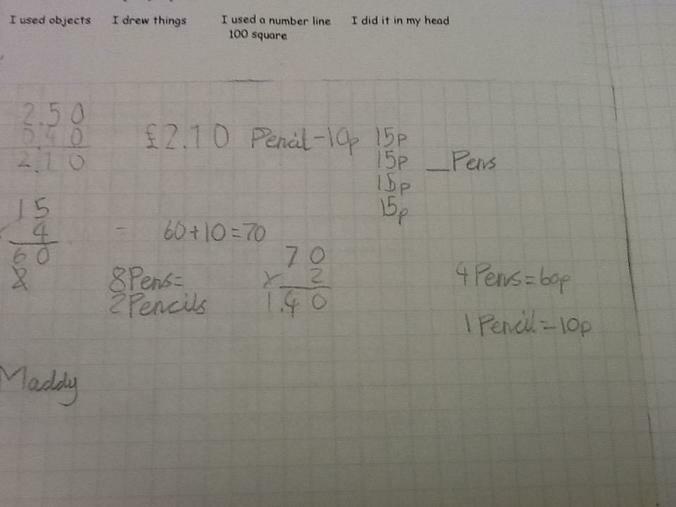 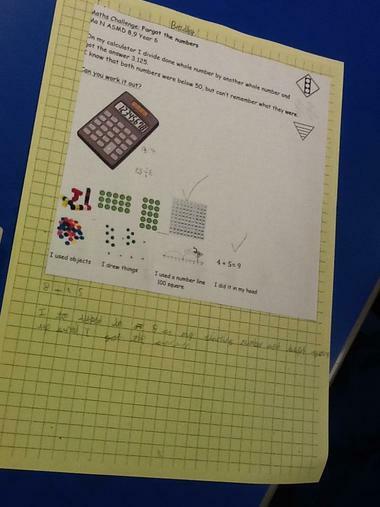 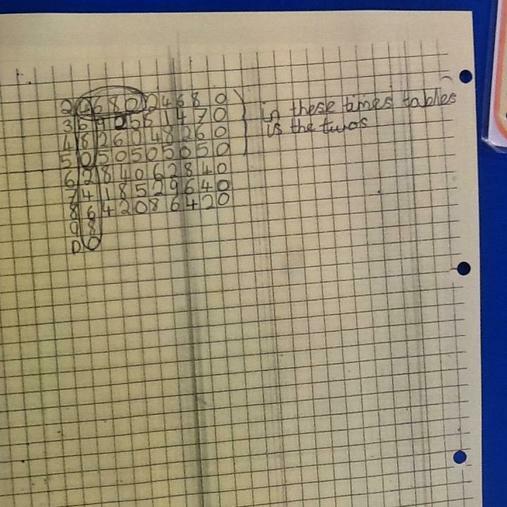 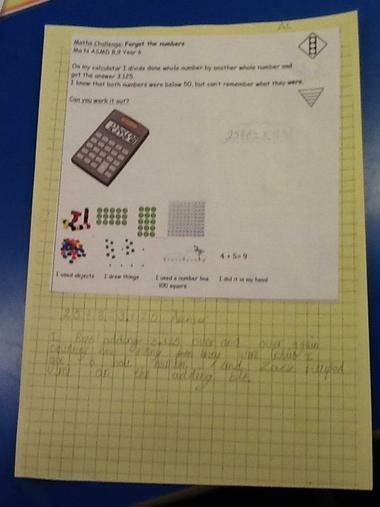 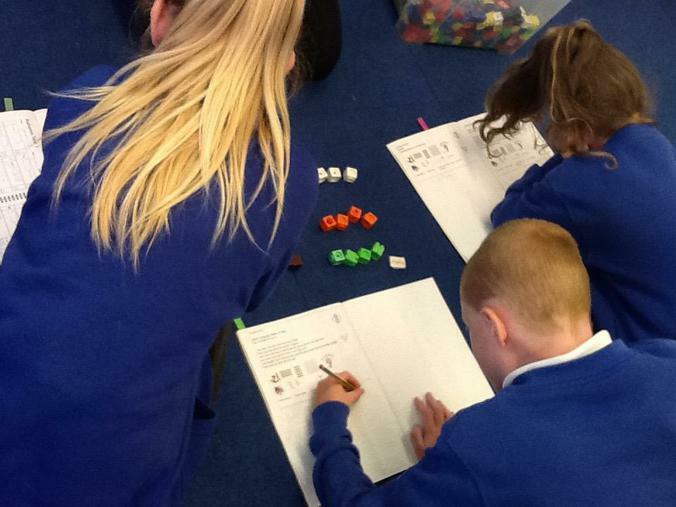 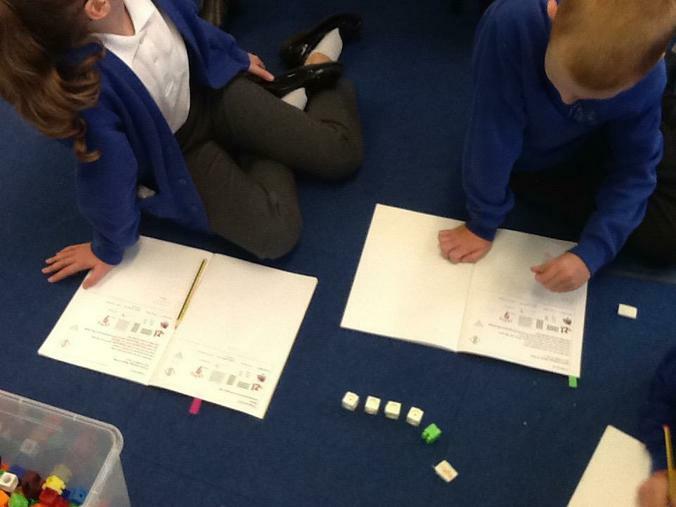 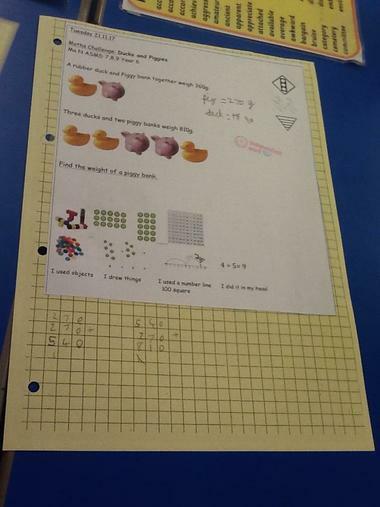 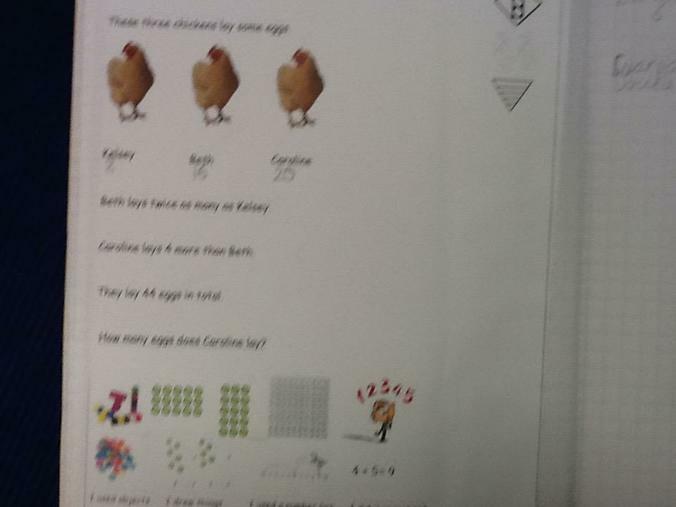 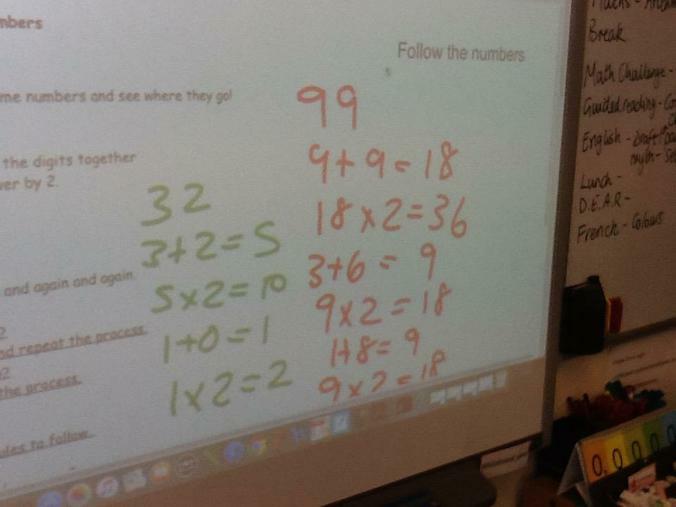 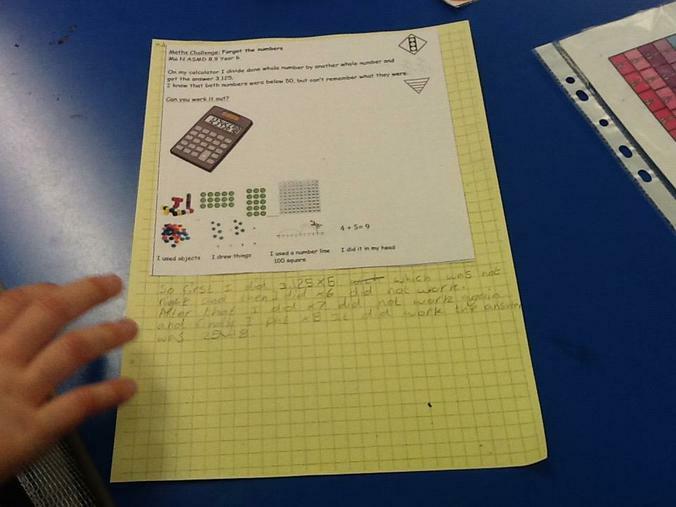 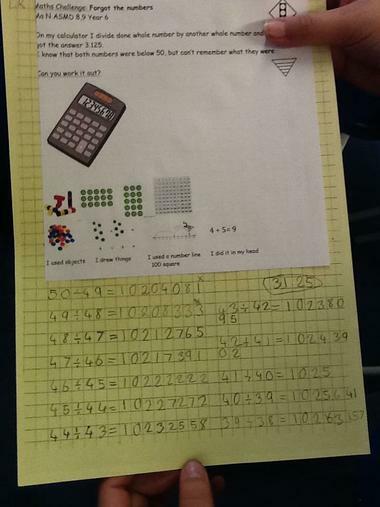 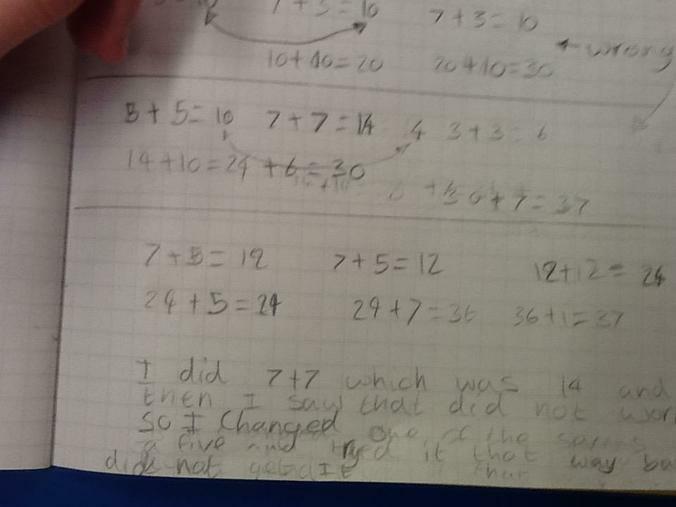 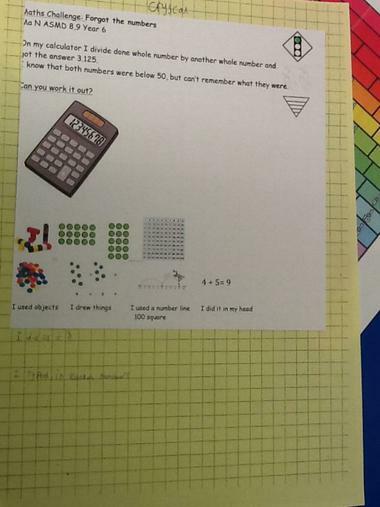 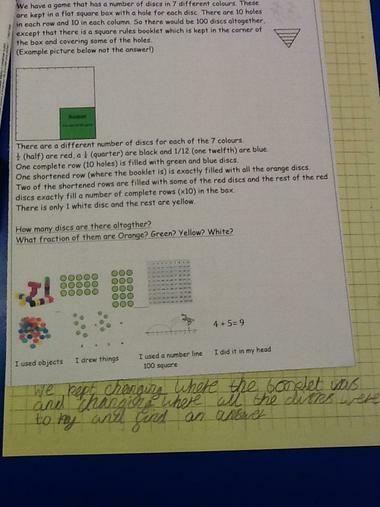 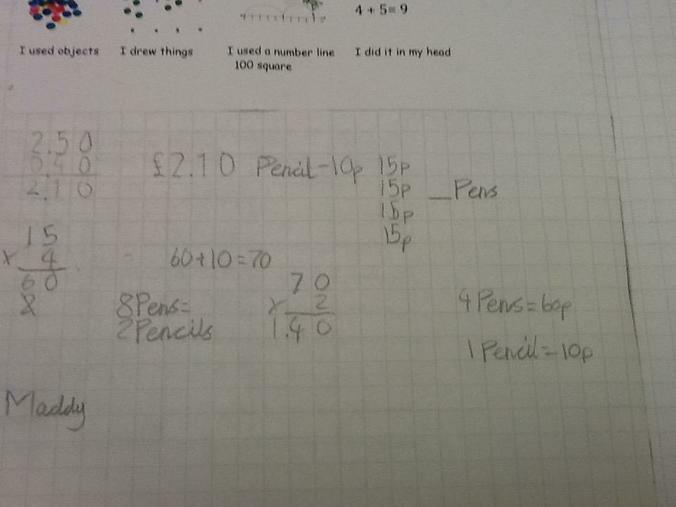 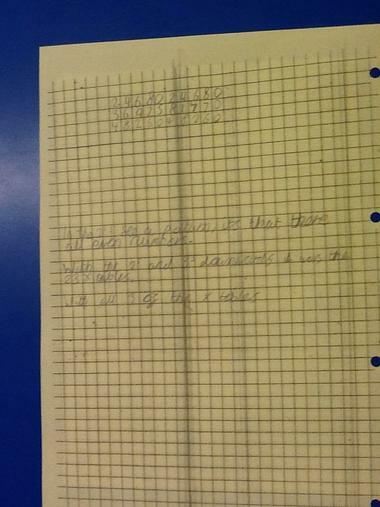 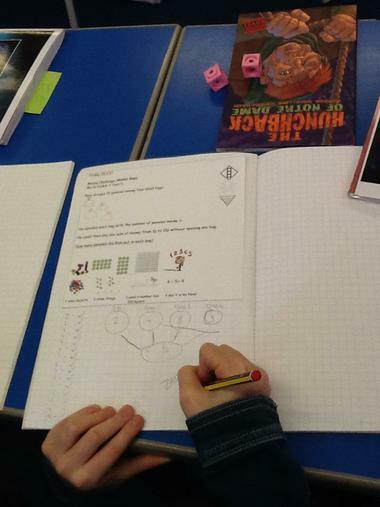 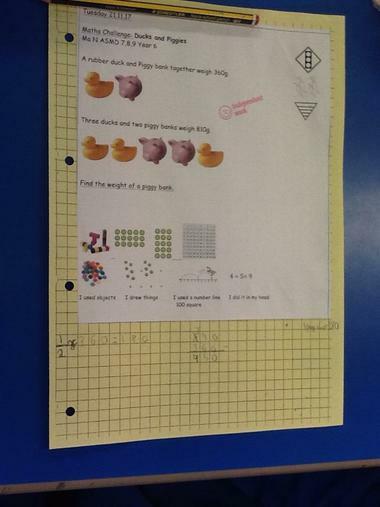 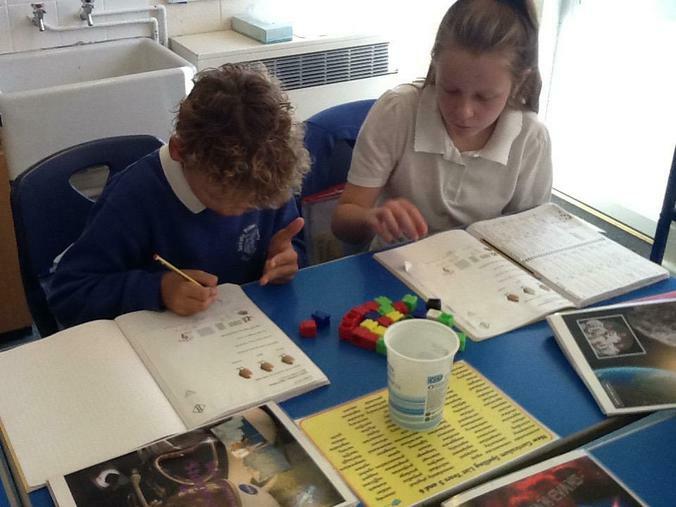 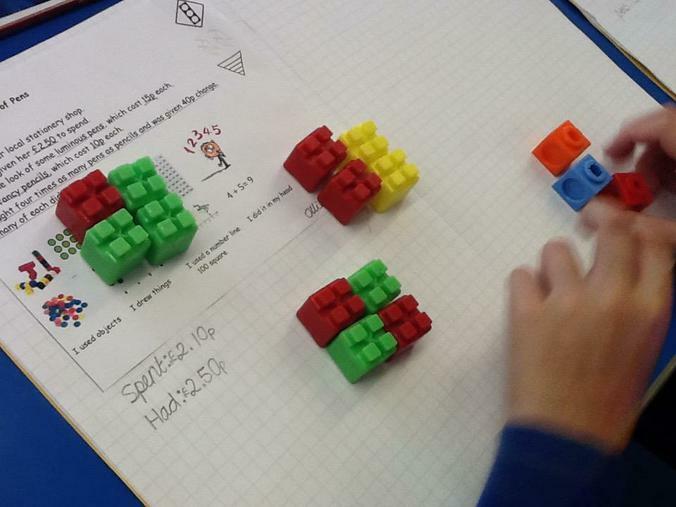 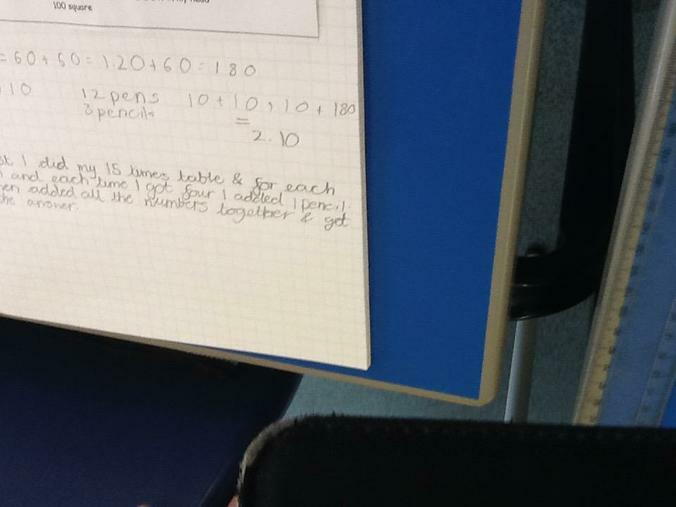 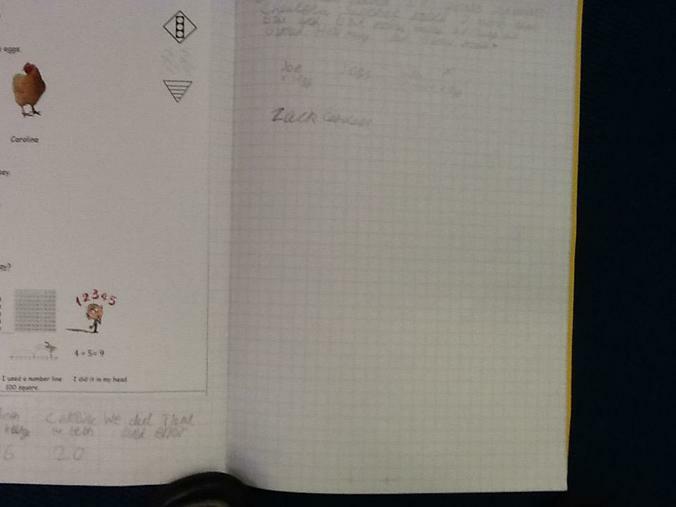 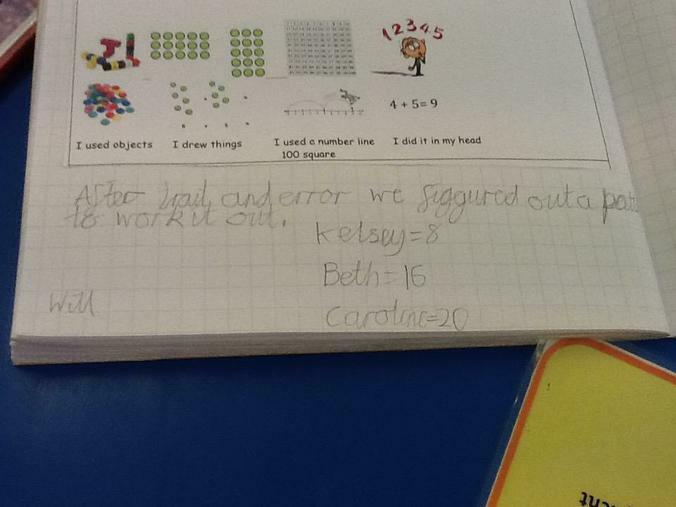 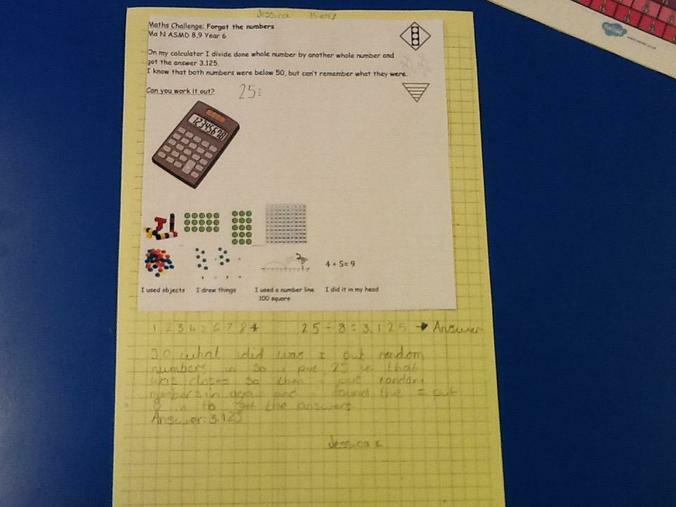 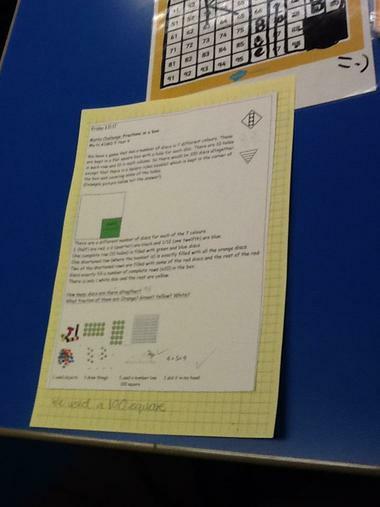 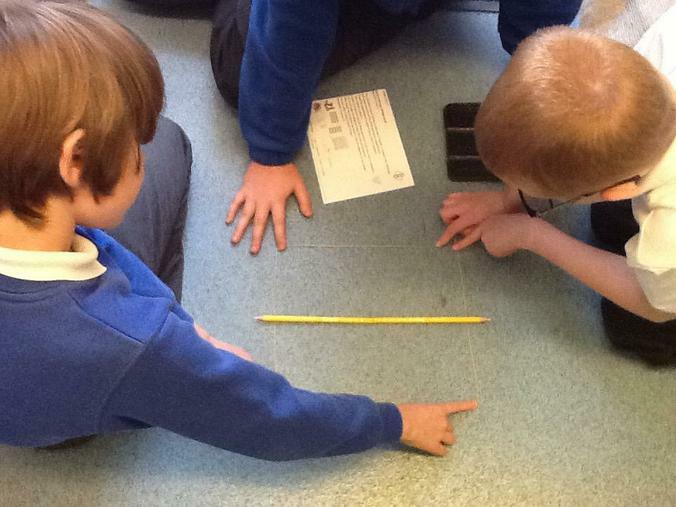 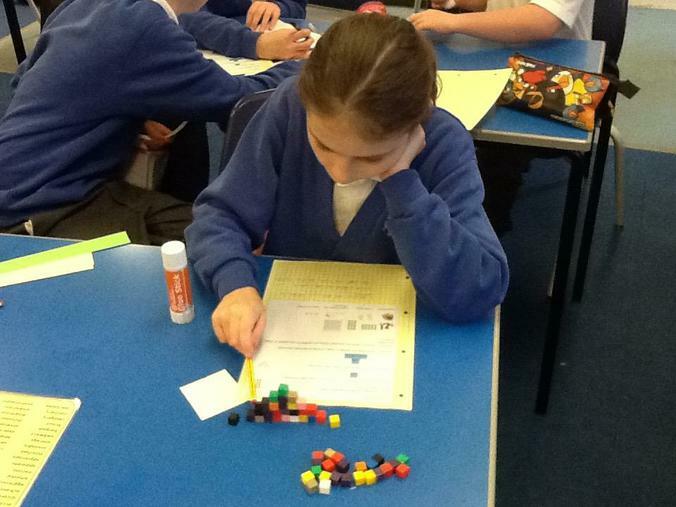 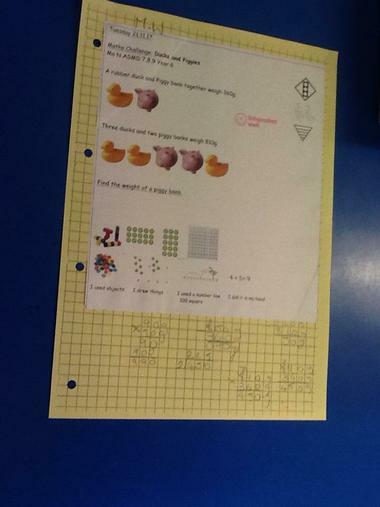 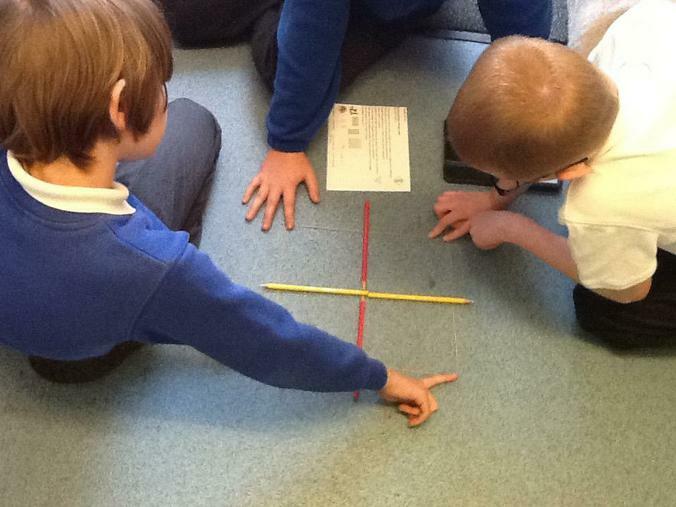 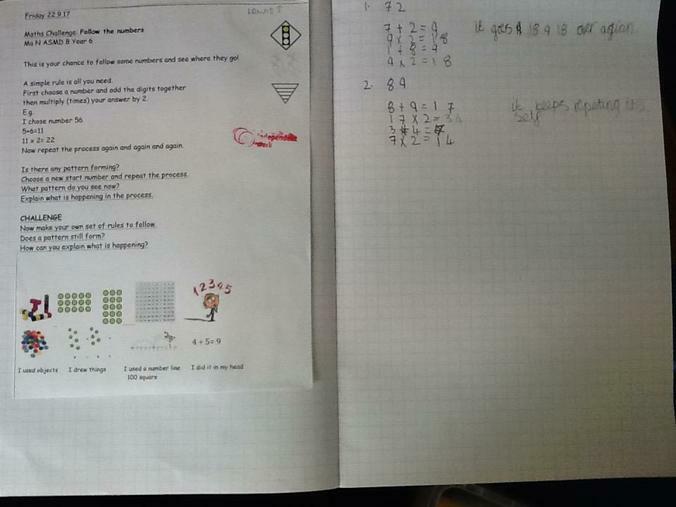 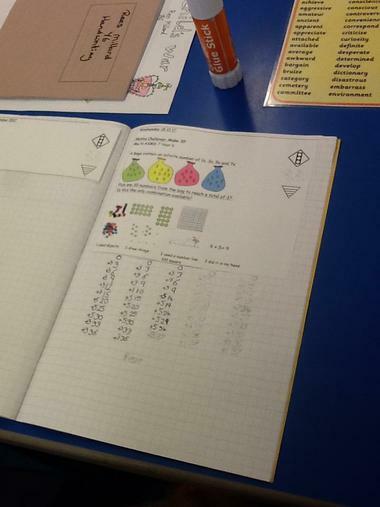 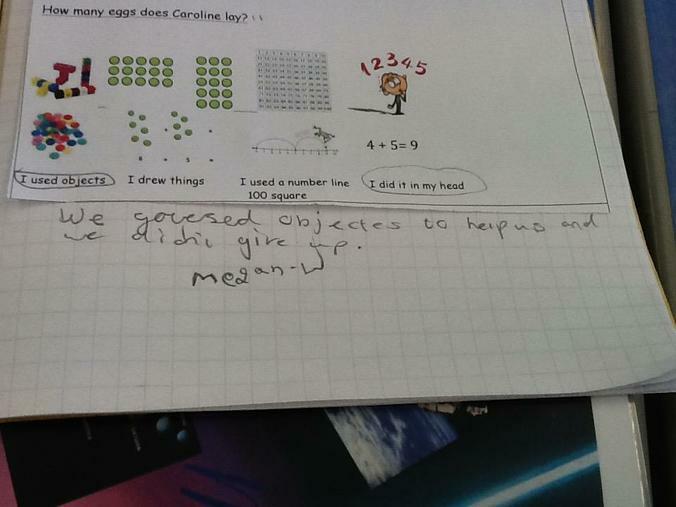 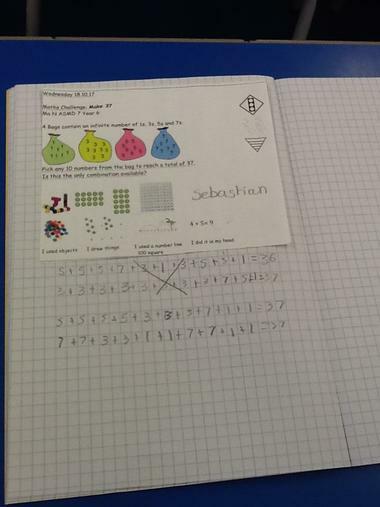 This week's task required the children to work systematically but also work backwards to find missing amounts. 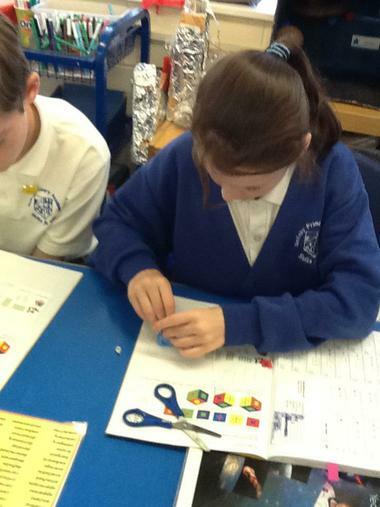 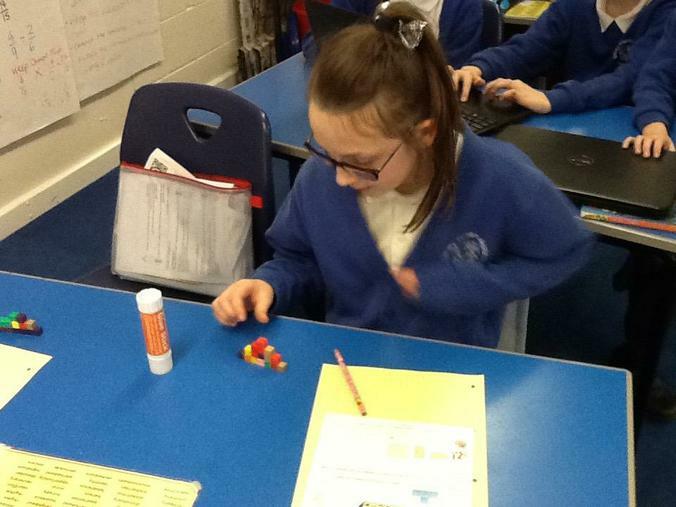 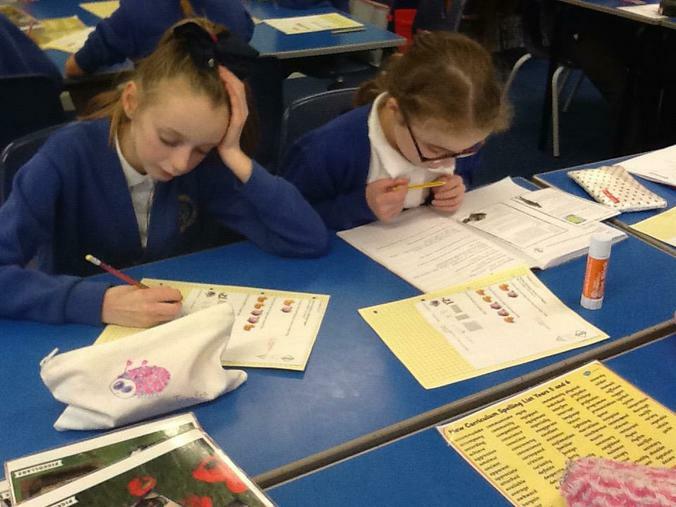 This week's challenge was aimed at using logical reasoning to find the amount of coins put in each bag. 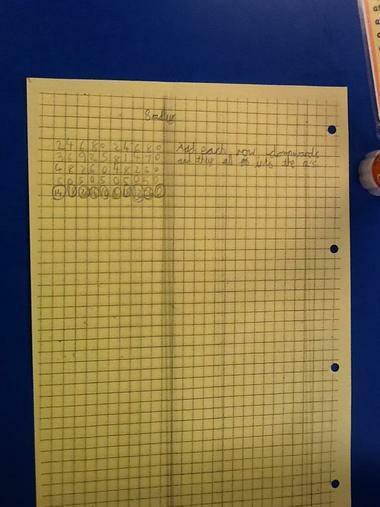 The children had to prove that they could pay for any amount between 1p and 15p by just using a bag with a set amount of pennies in. 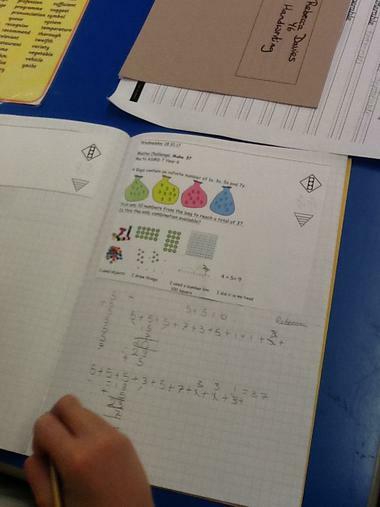 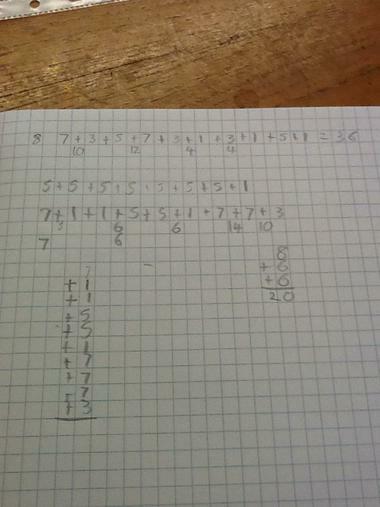 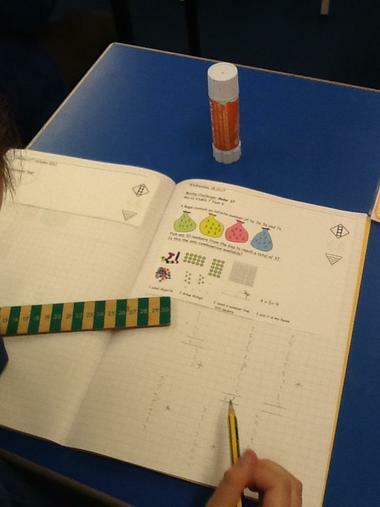 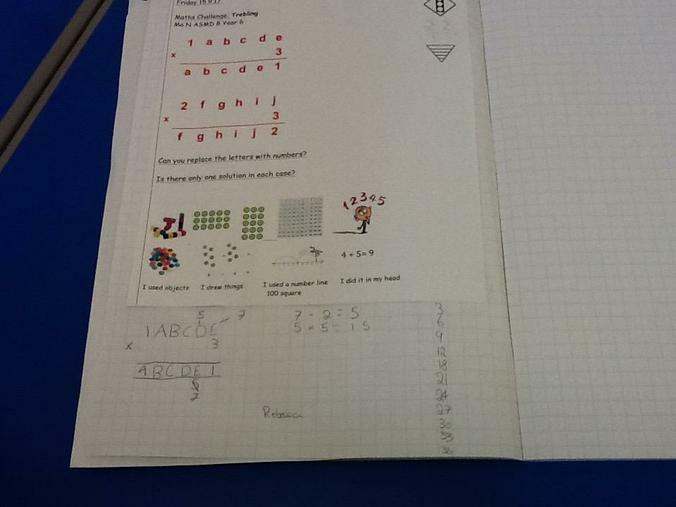 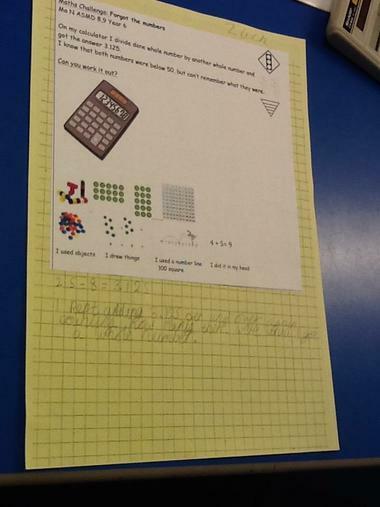 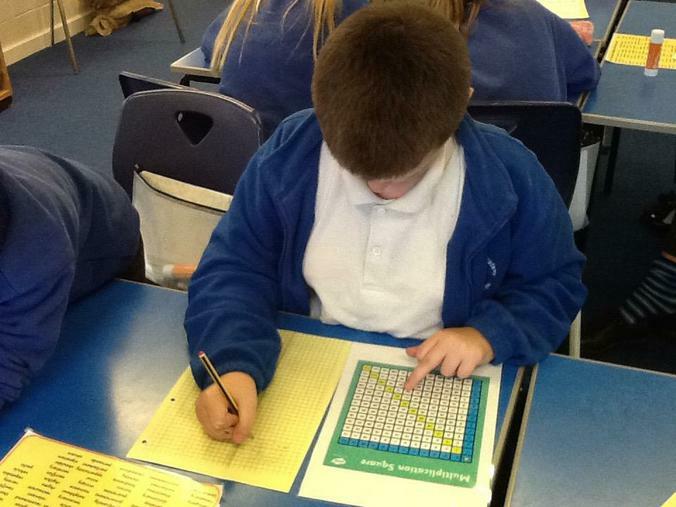 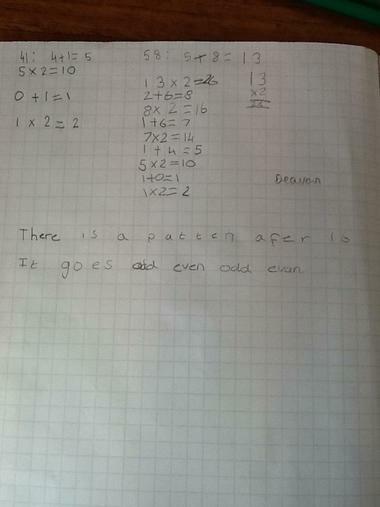 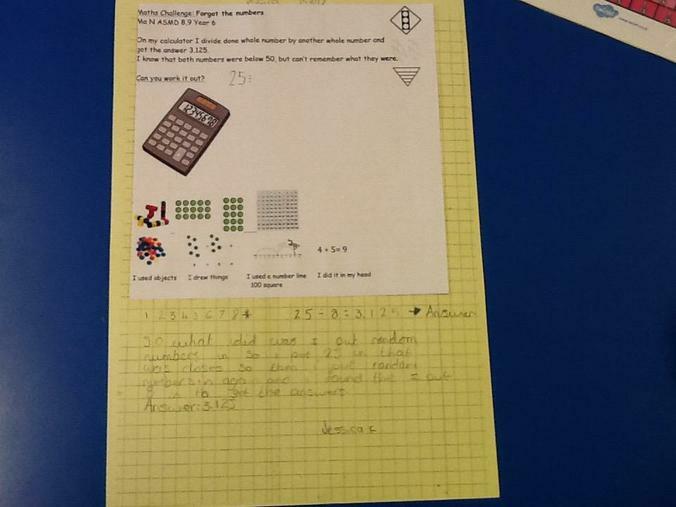 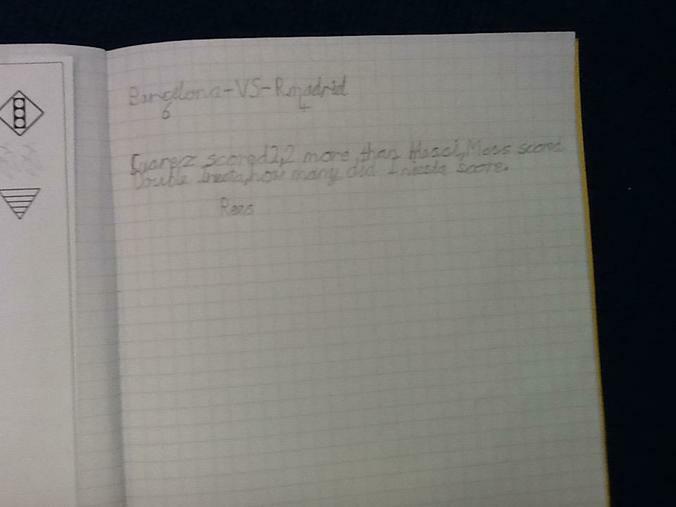 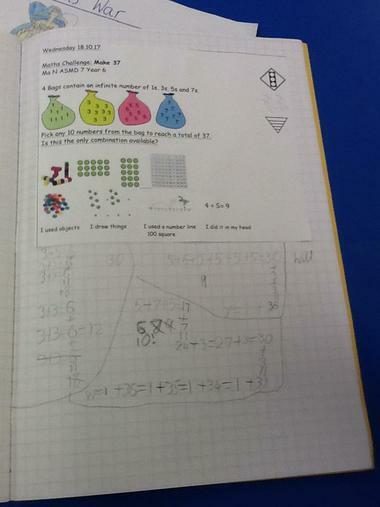 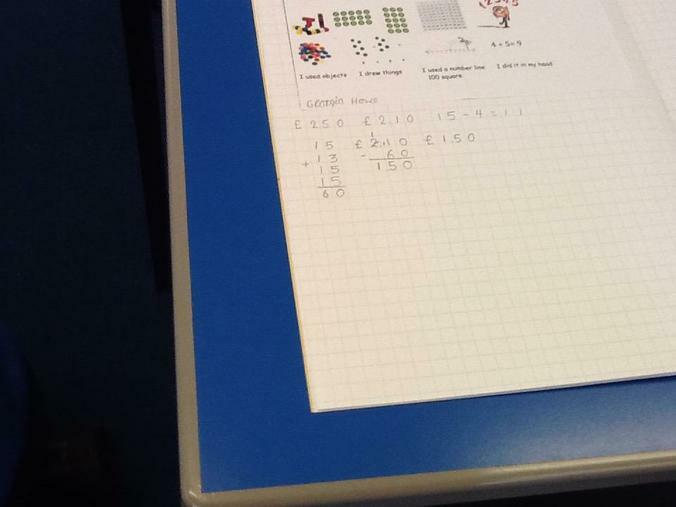 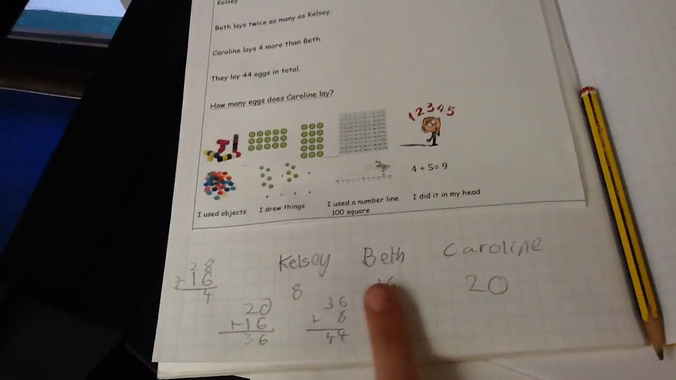 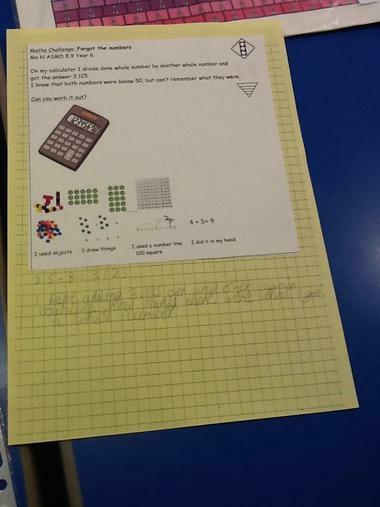 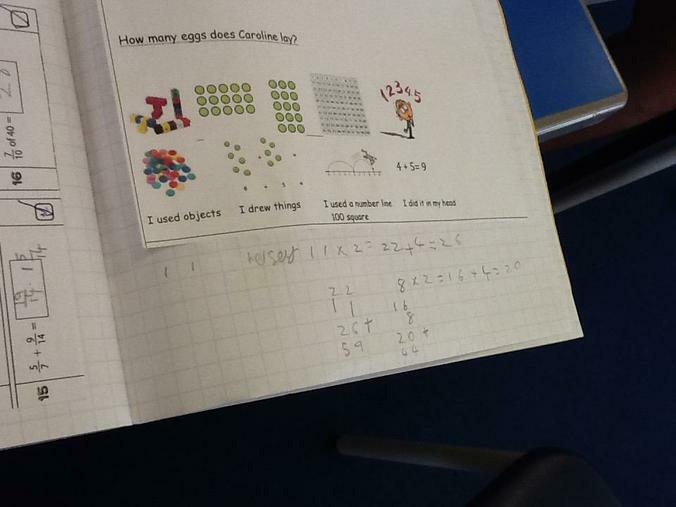 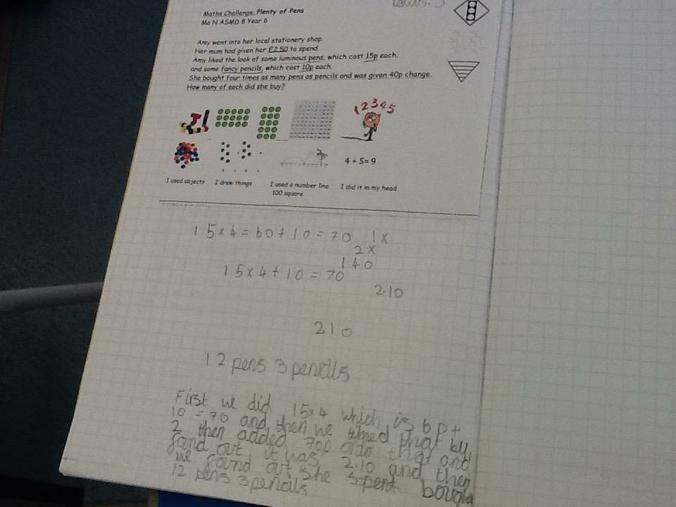 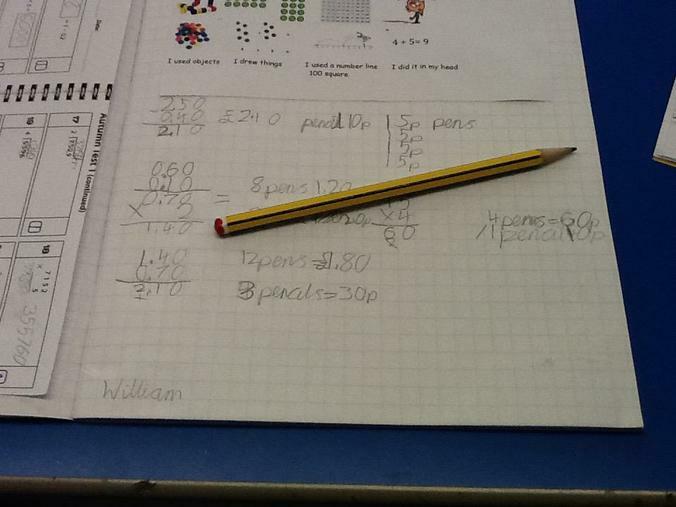 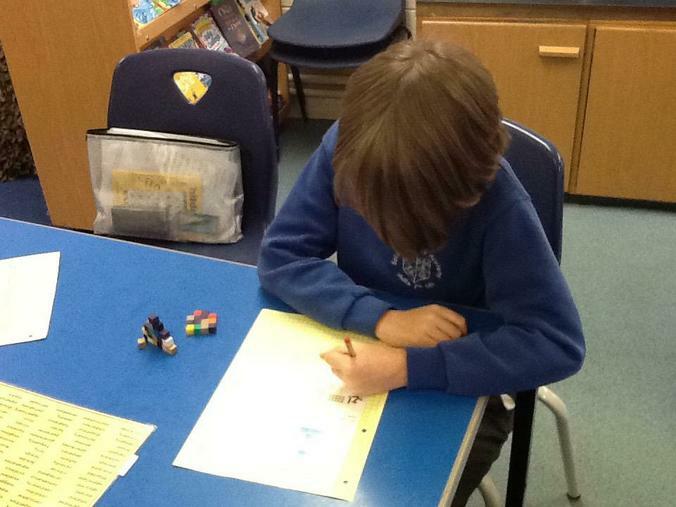 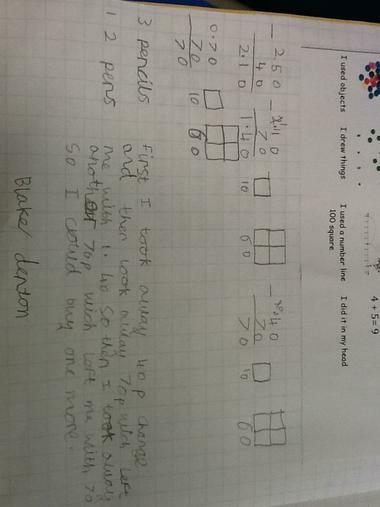 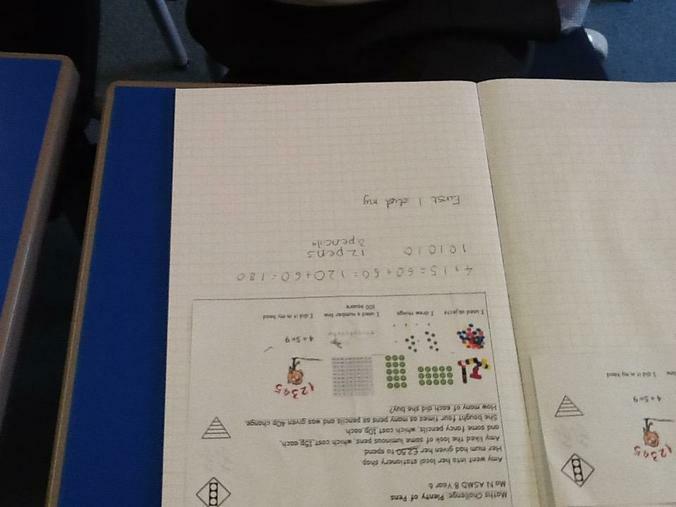 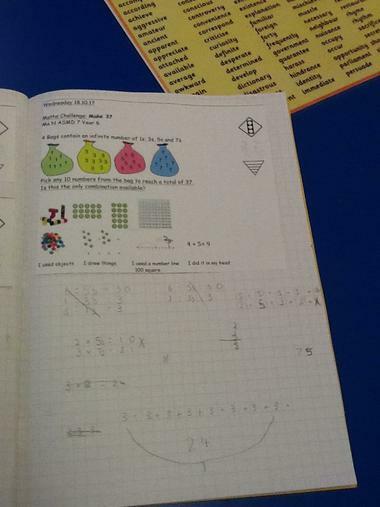 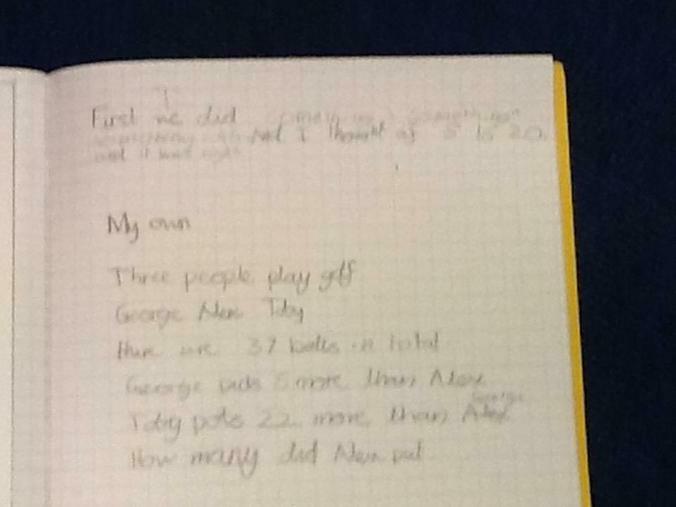 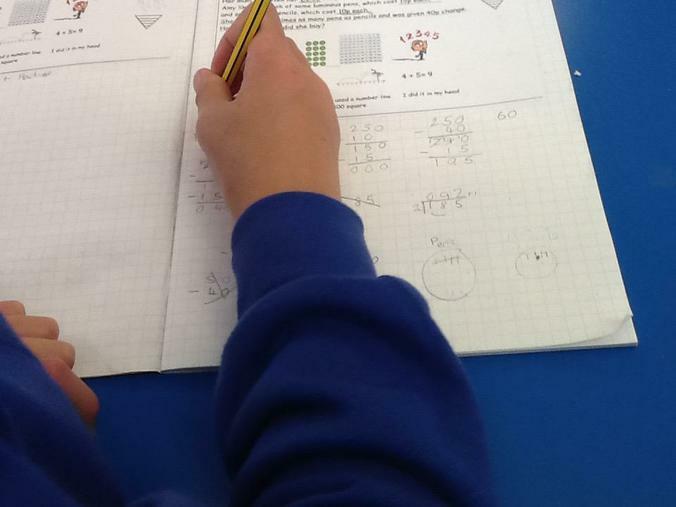 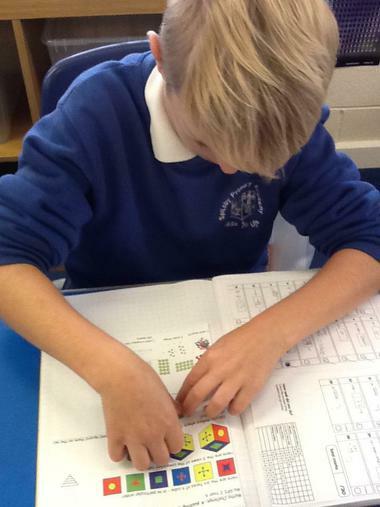 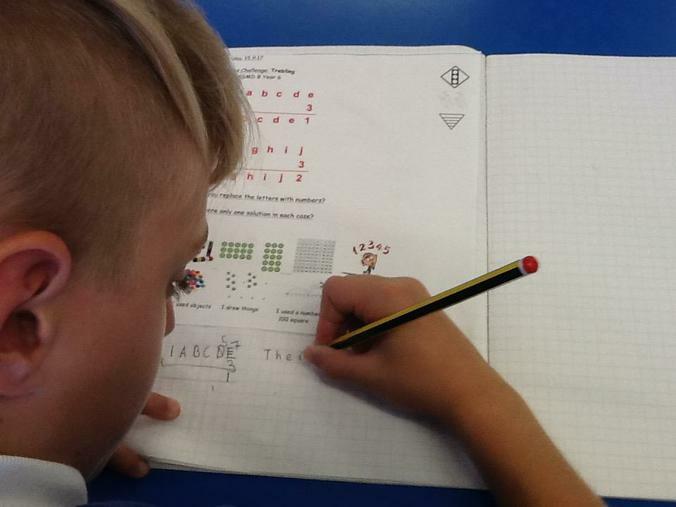 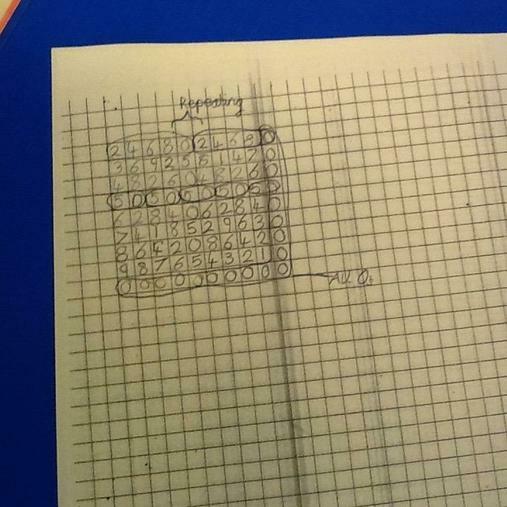 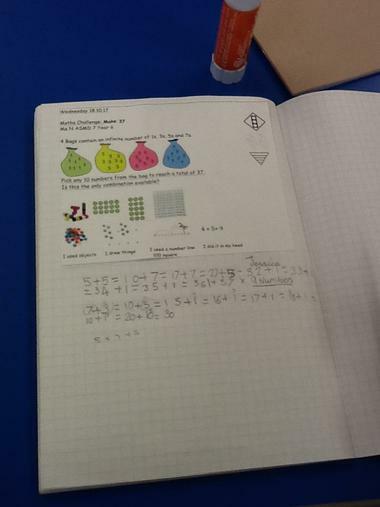 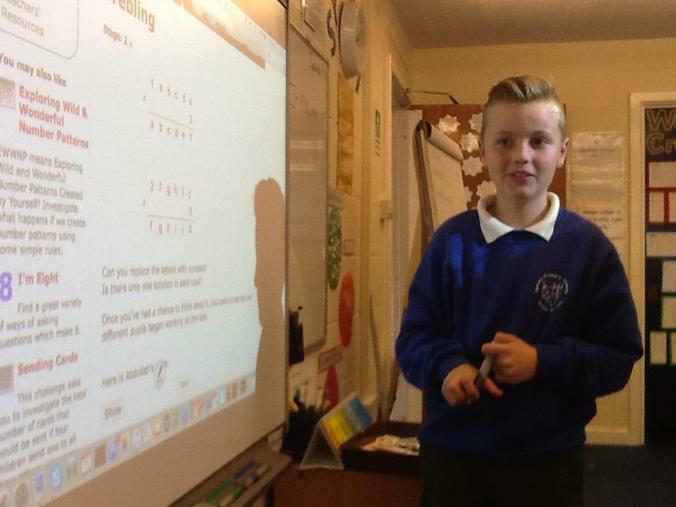 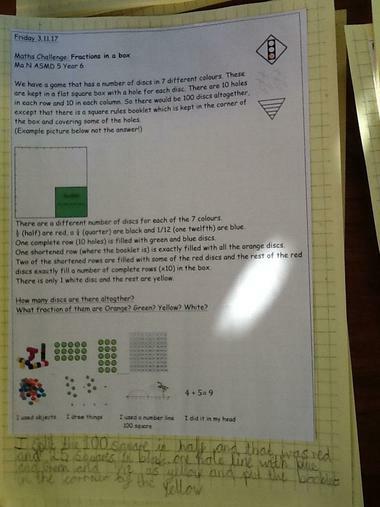 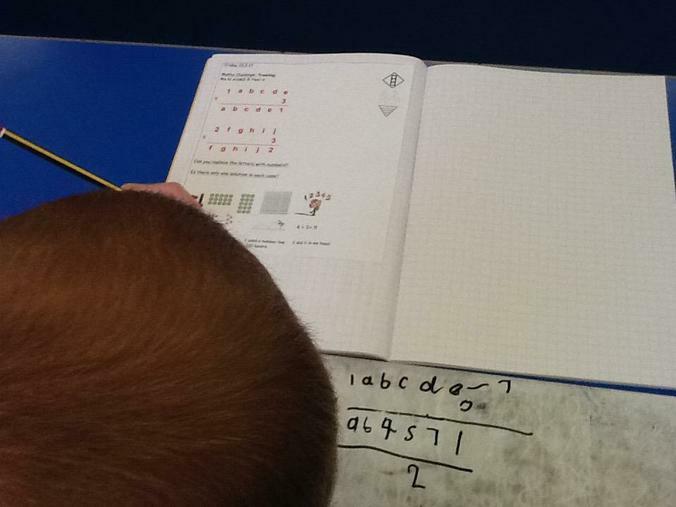 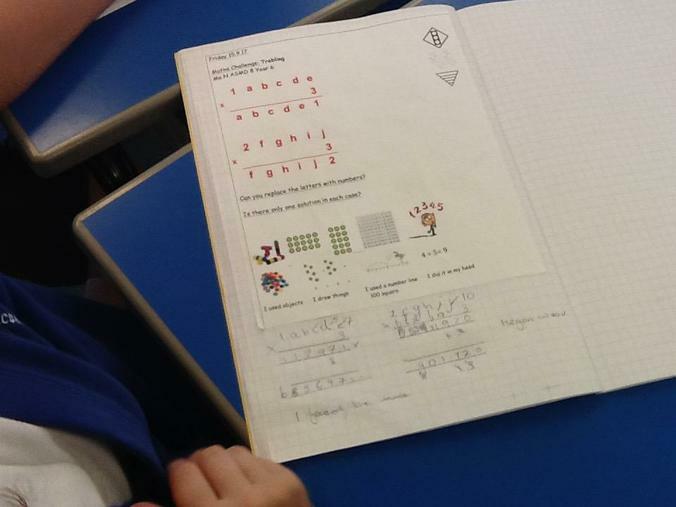 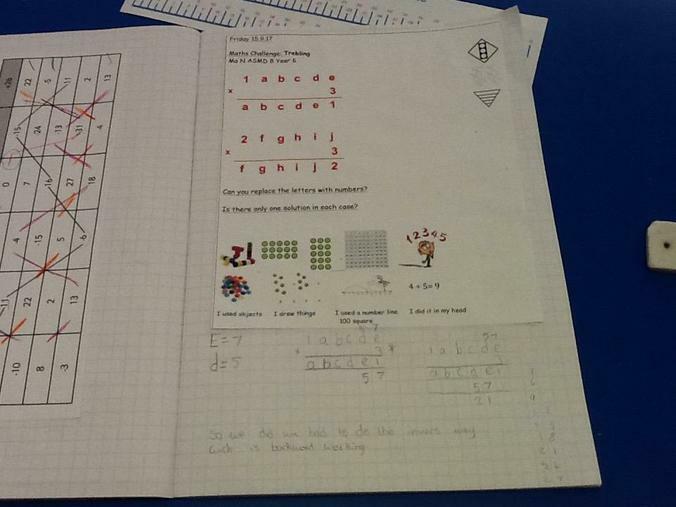 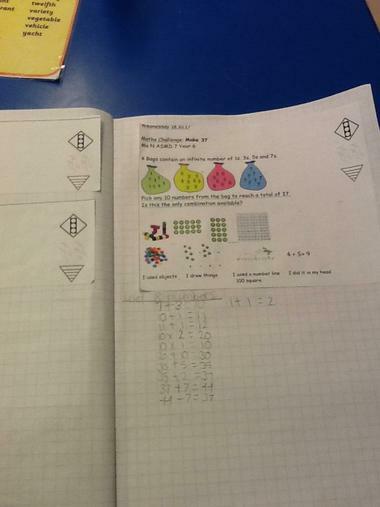 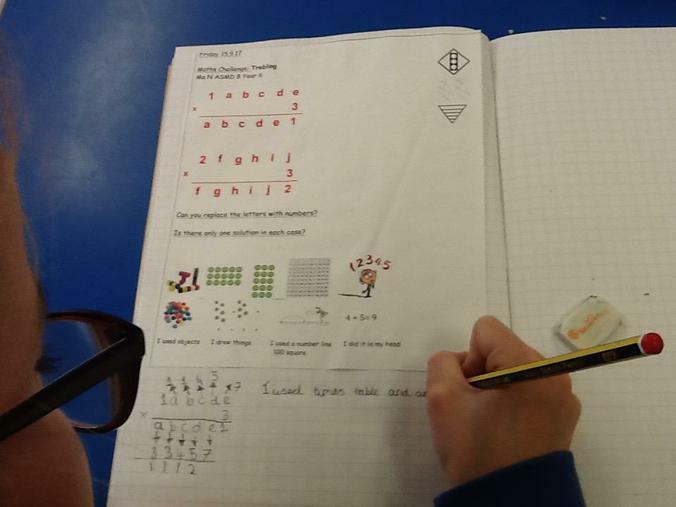 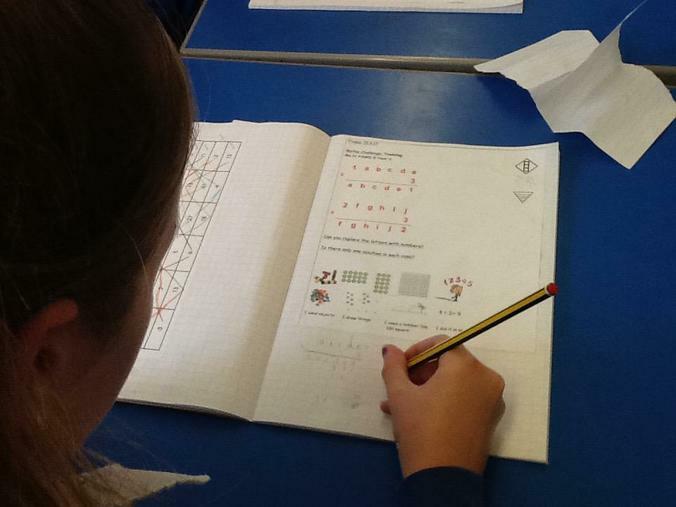 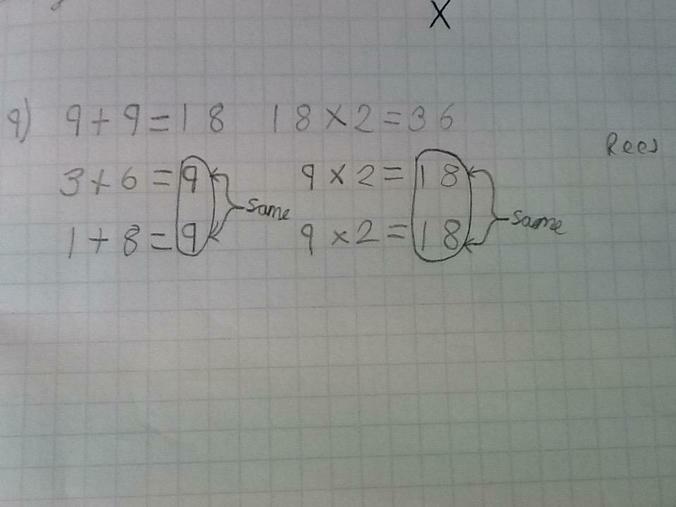 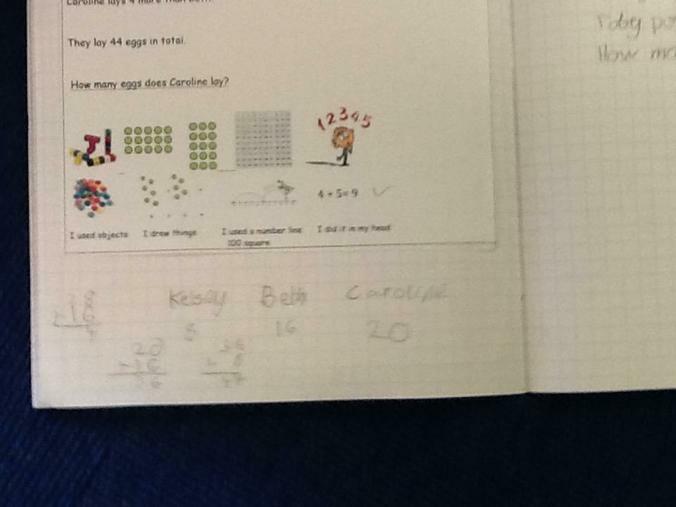 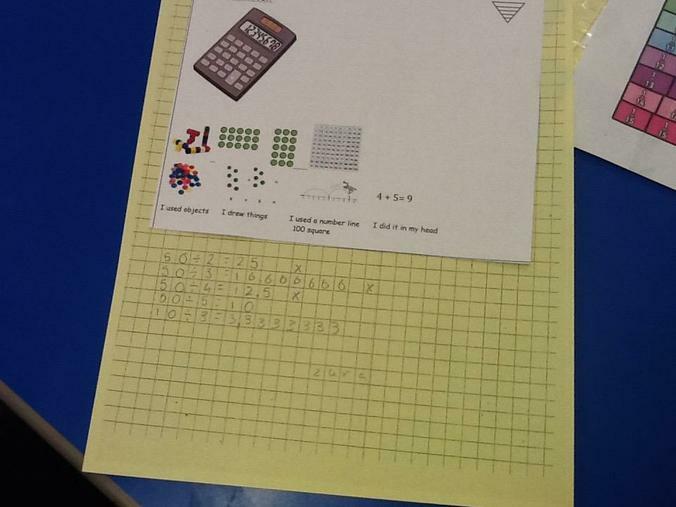 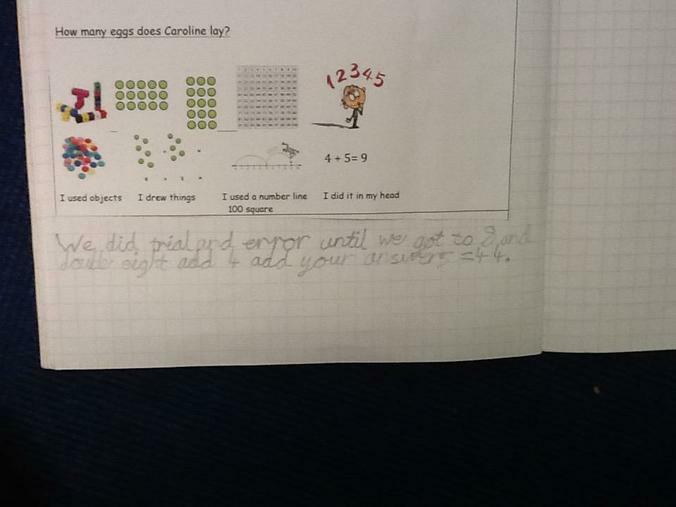 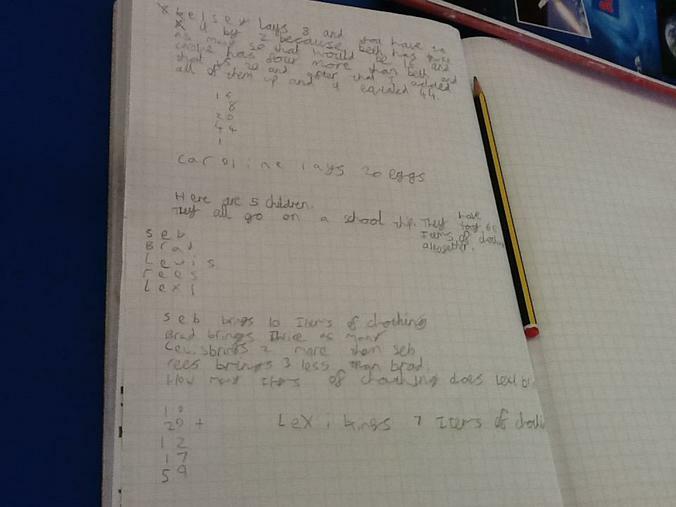 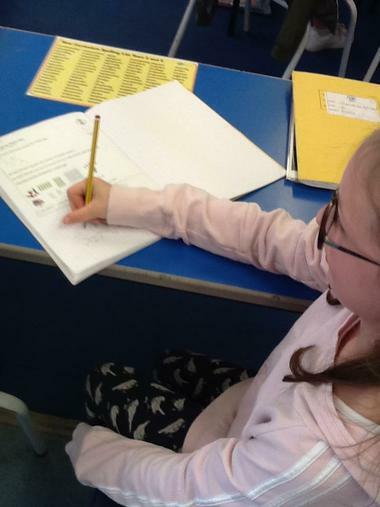 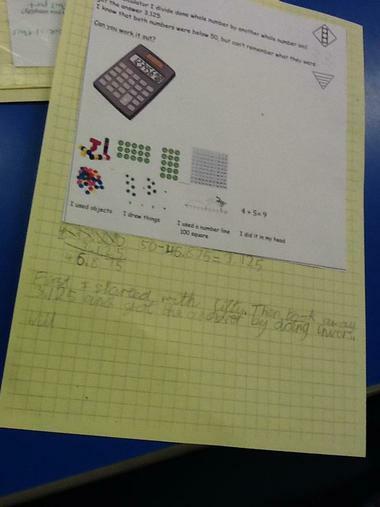 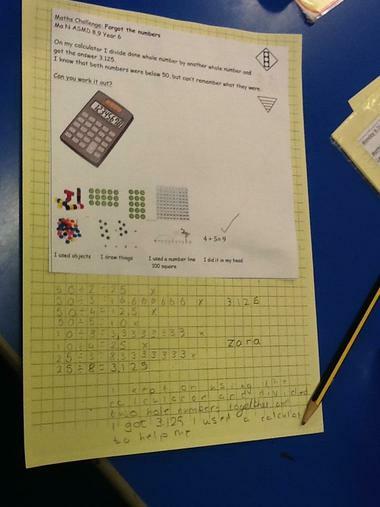 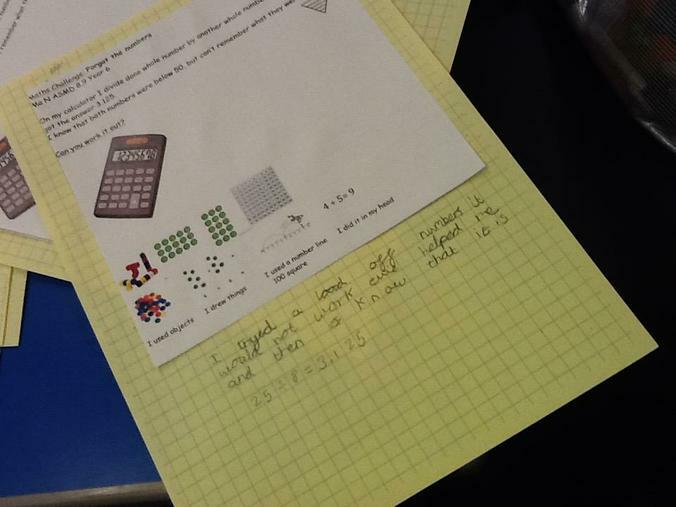 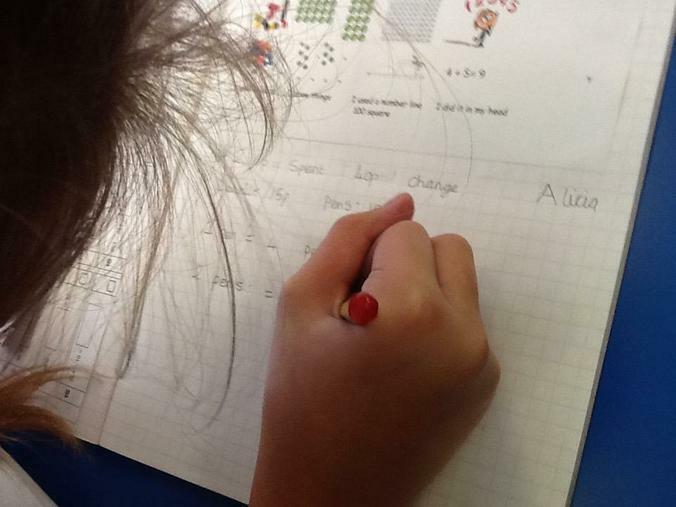 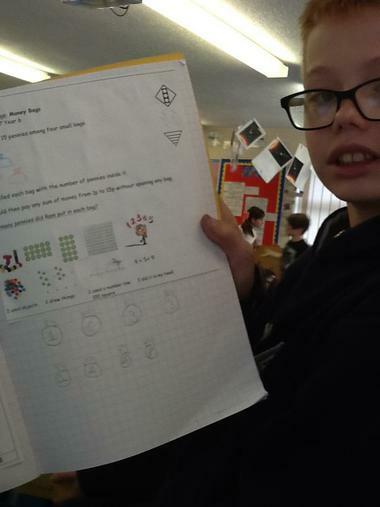 This week's challenge was to try and spot patterns in numbers after following a set rule of adding and multiplying. 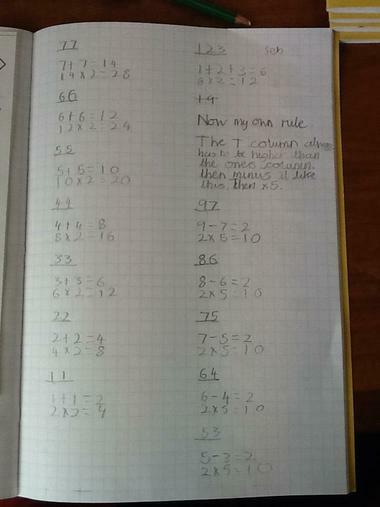 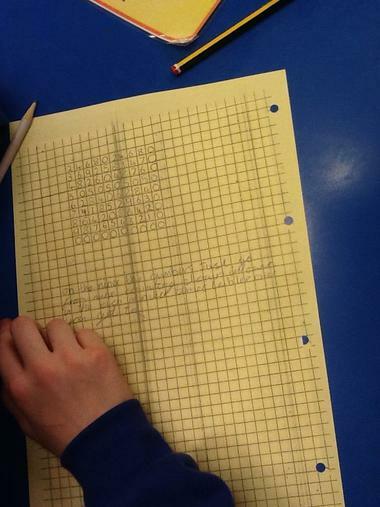 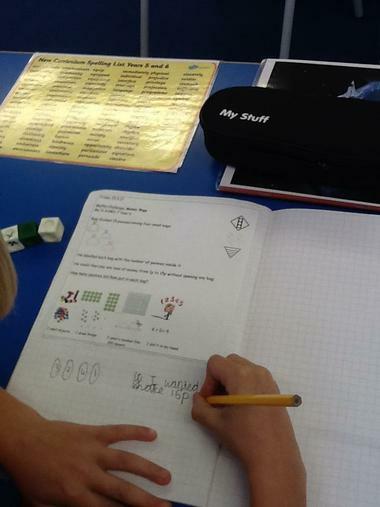 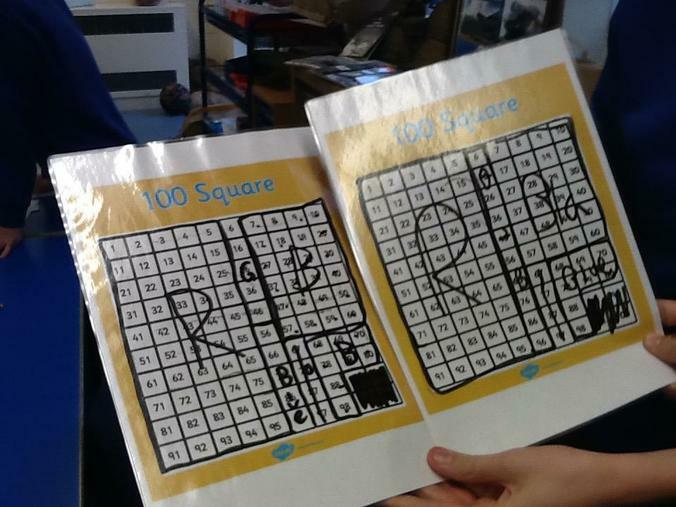 The children were then challenged to create their own set of rules and see if they could make a pattern emerge. 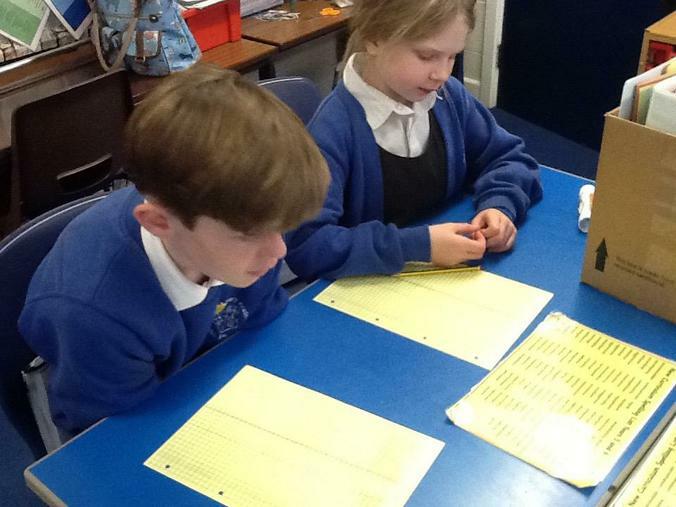 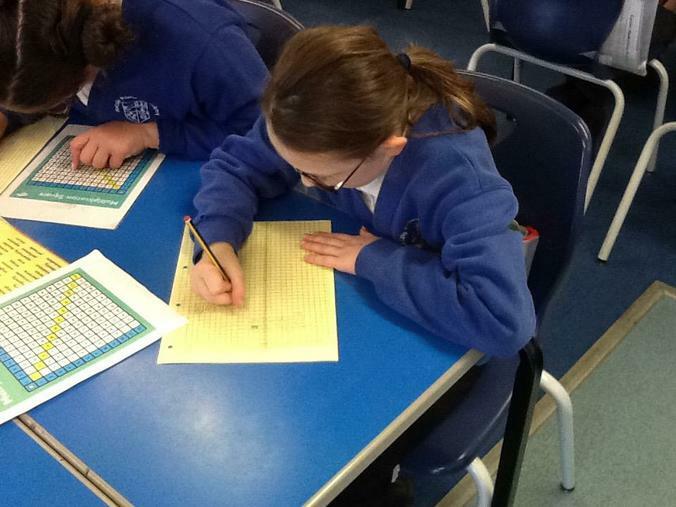 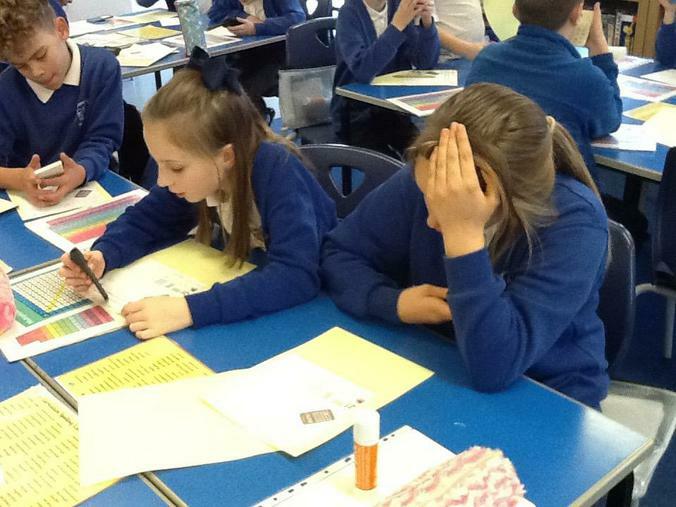 This week's challenge required using times table facts and the knowledge of how to exchange when calculating to solve the coded question. 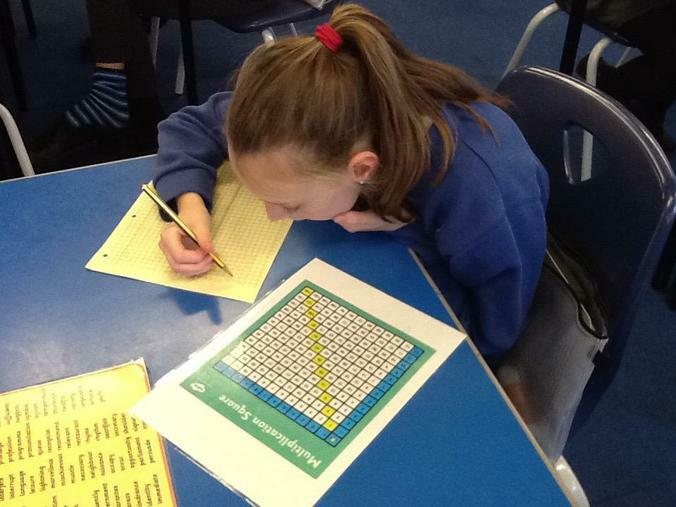 Each letter represented a number and would only make the answer correct if all the above skills were used.